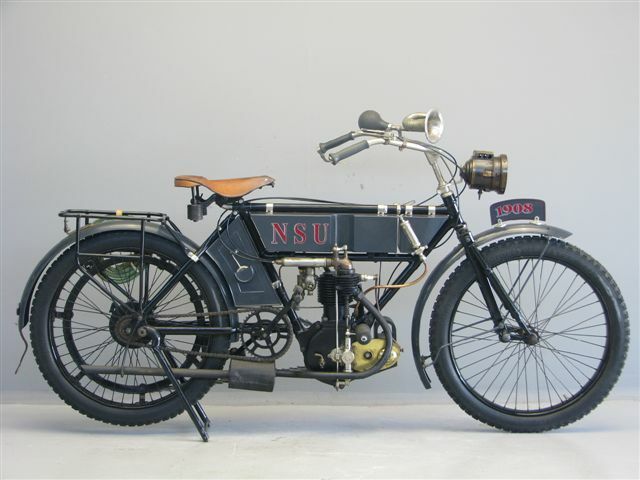 NSU Motorenwerke AG, normally just NSU, was a German manufacturer of automobiles, motorcycles and pedal cycles, founded in 1873. 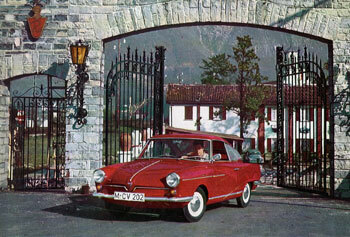 It was acquired by Volkswagen Group in 1969. 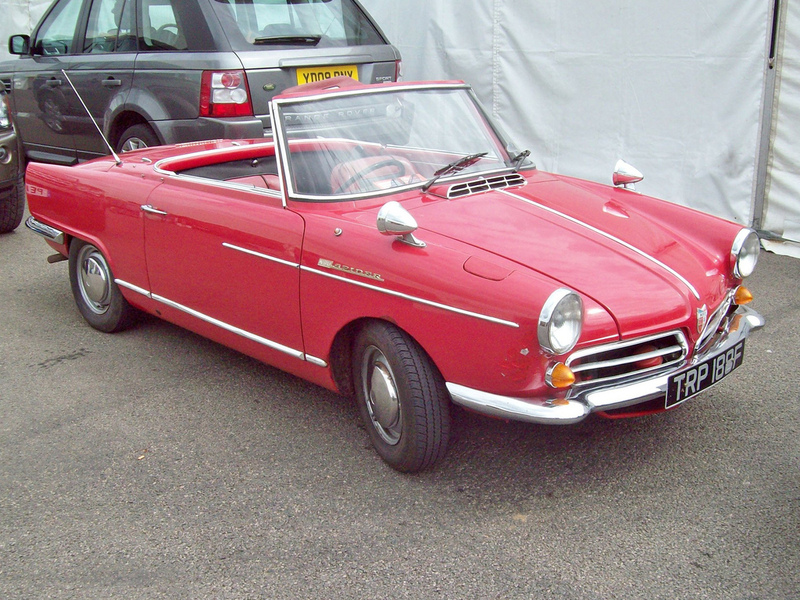 VW merged the company with Auto Union, to eventually evolve into Audi as it is known today. 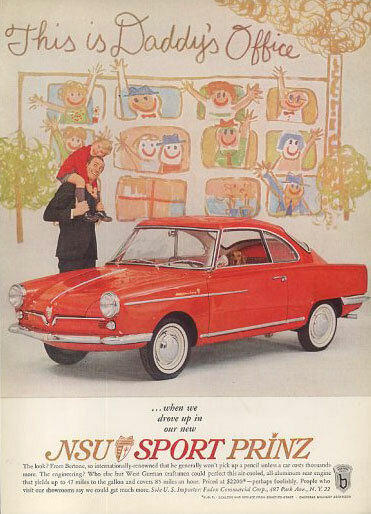 NSU originated as the “Mechanische Werkstätte zur Herstellung von Strickmaschinen”, a knitting machine manufacturer established in 1873 by Christian Schmidt, a technically astute entrepreneur, in the town of Riedlingen on the Danube. 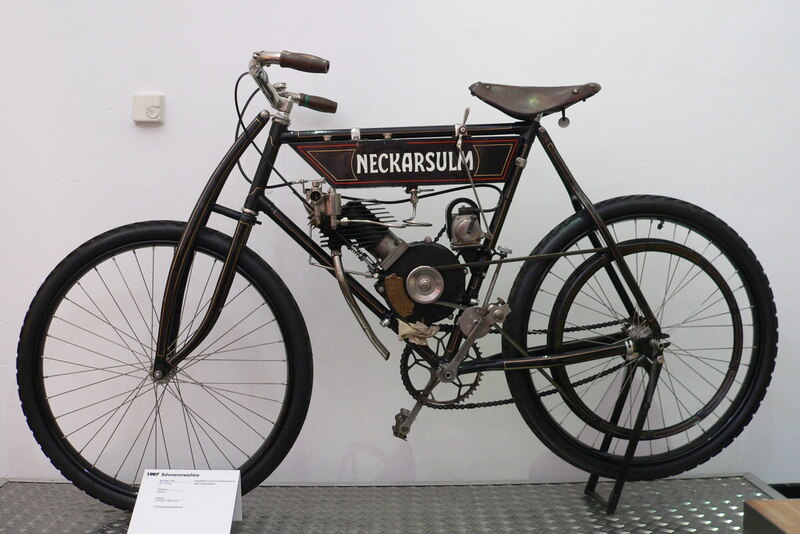 The business relocated in 1880 to Neckarsulm, where the river Sulm flows into the Neckar. 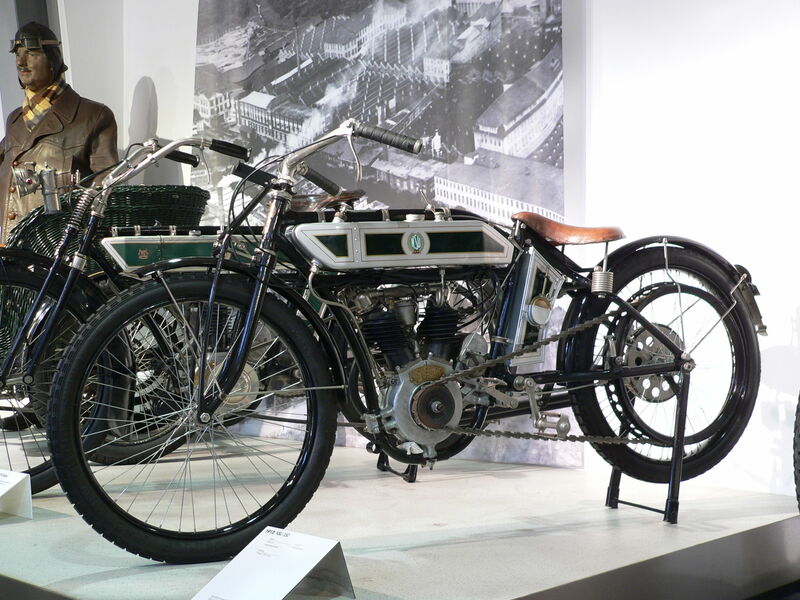 There followed a period of rapid growth and in 1886 the company began to produce bicycles, the first of them branded as the “Germania”. 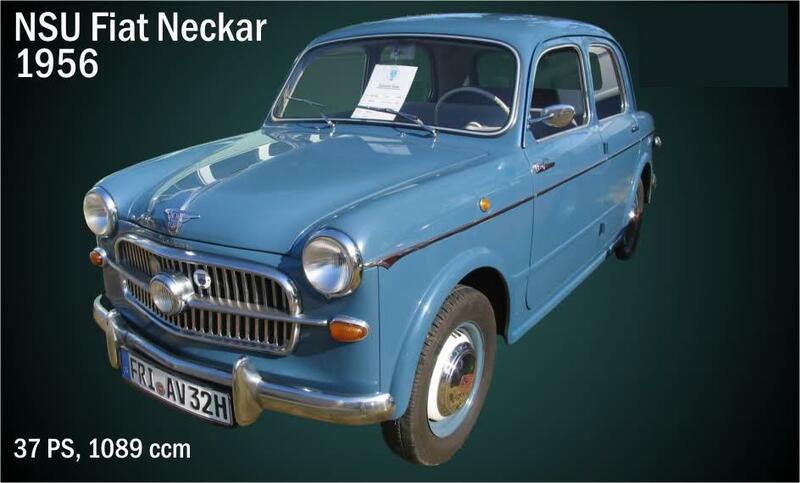 By this time, the company was named Neckarsulm Strickmaschinen Union. 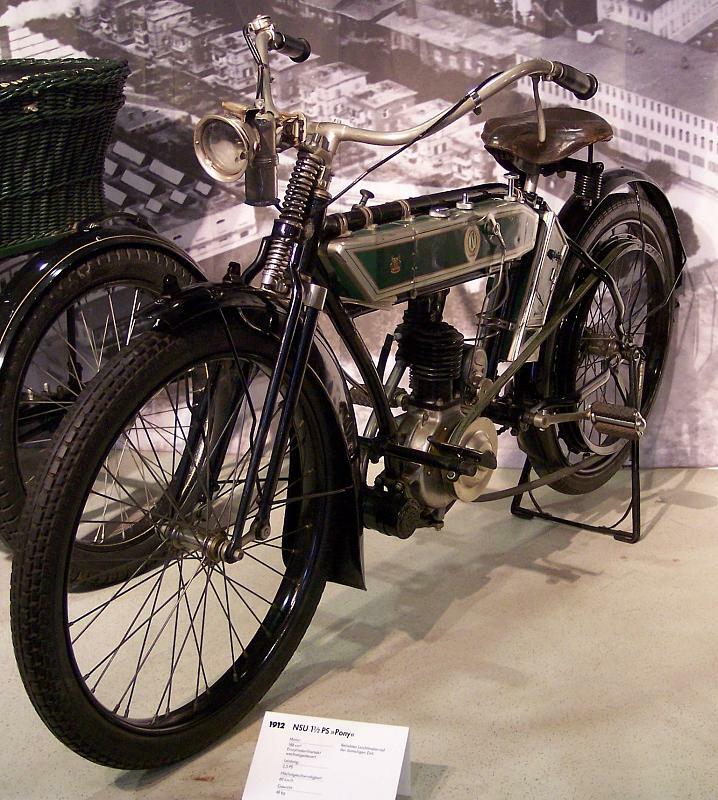 By 1892, bicycle manufacturing had completely replaced knitting machine production. 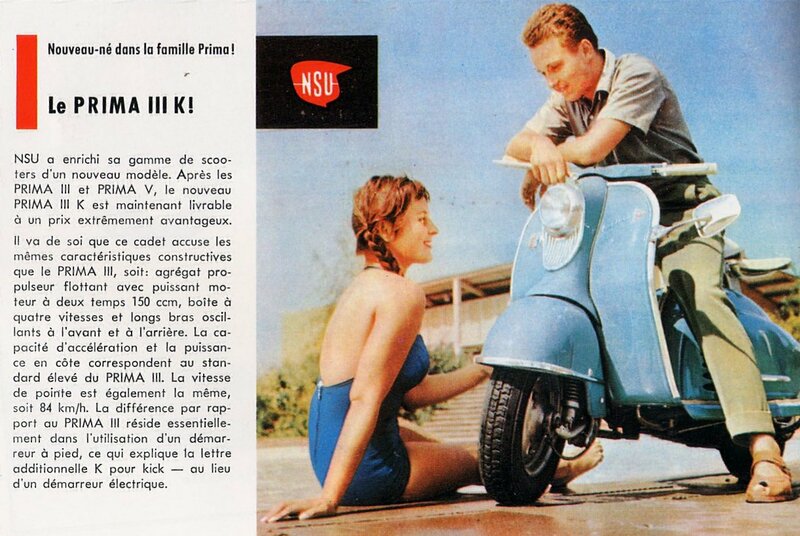 At about this time, the name NSU appeared as a brand name. 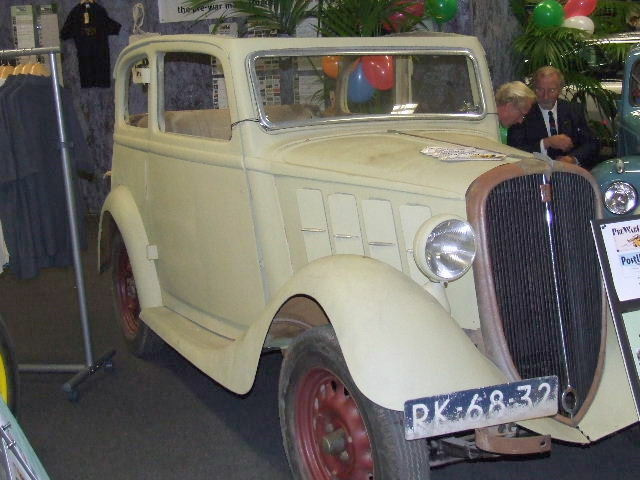 In 1932, under pressure from the bank, NSU recognised the failure of their attempt to break into volume automobile production, and their recently built car factory in Heilbronn was sold to Fiat, who used the plant to assemble Fiat models for the German market. 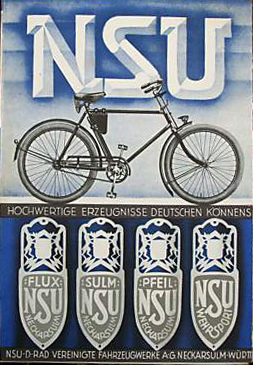 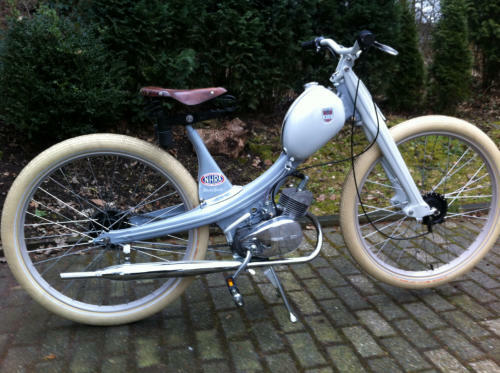 In December 1946 Das Auto reported the company had resumed the manufacture of bicycles and motor-bicycles at Neckarsulm. 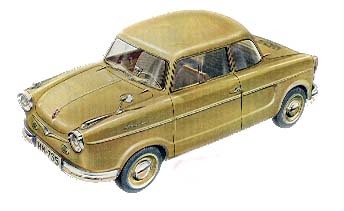 For Germany this was a time of new beginnings: in July 1946, a new board had been appointed, headed up by General Director Walter Egon Niegtsch, who earlier in his career had spent 17 years with Opel. 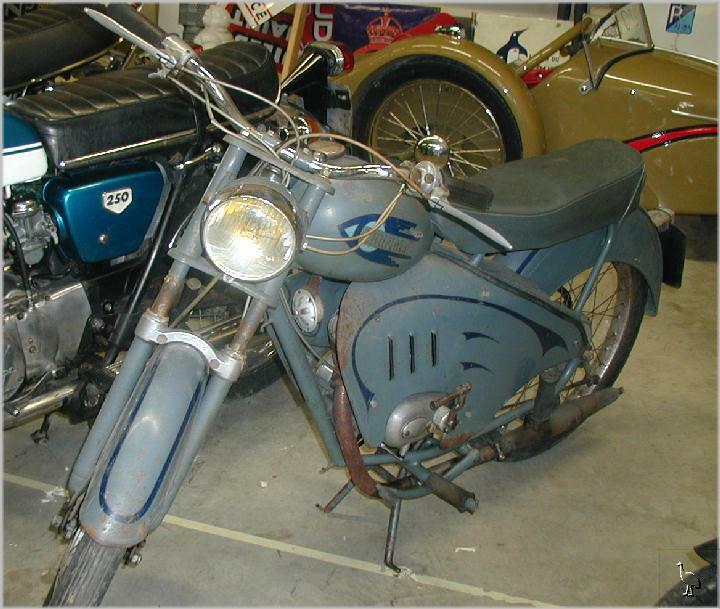 NSU motorbike production restarted, in a completely destroyed plant, with pre-war designs like the Quick, OSL and Konsul motorbikes; furthermore, the HK101 continued to be sold by NSU as an all-terrain vehicle in a civilian version. 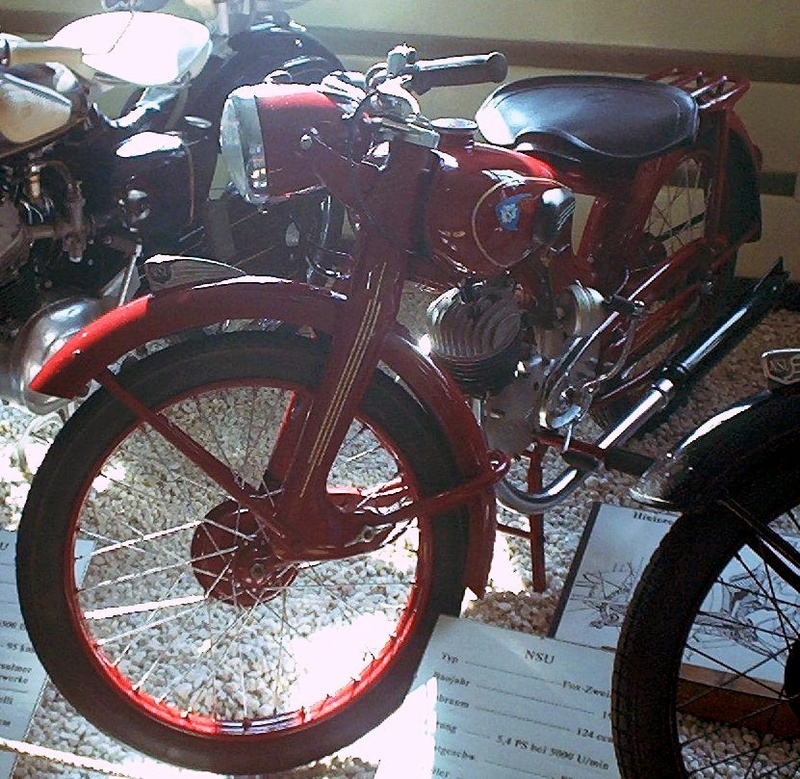 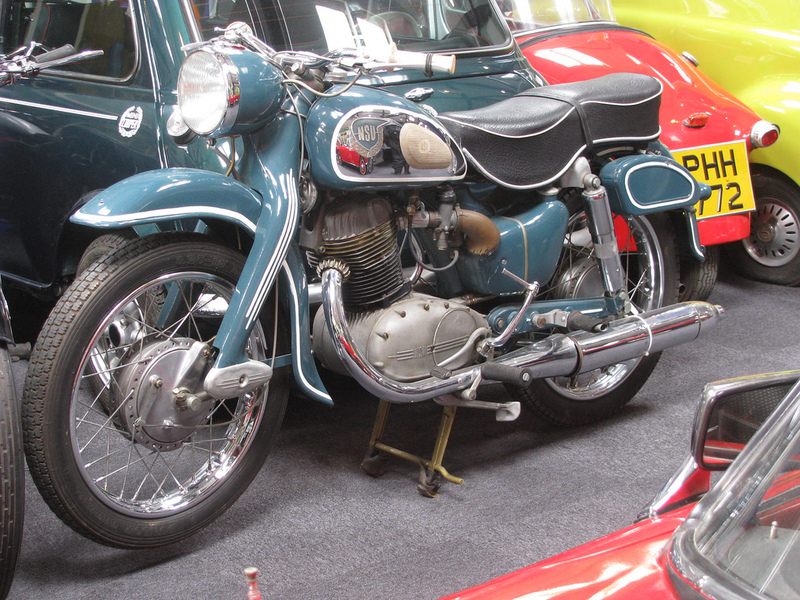 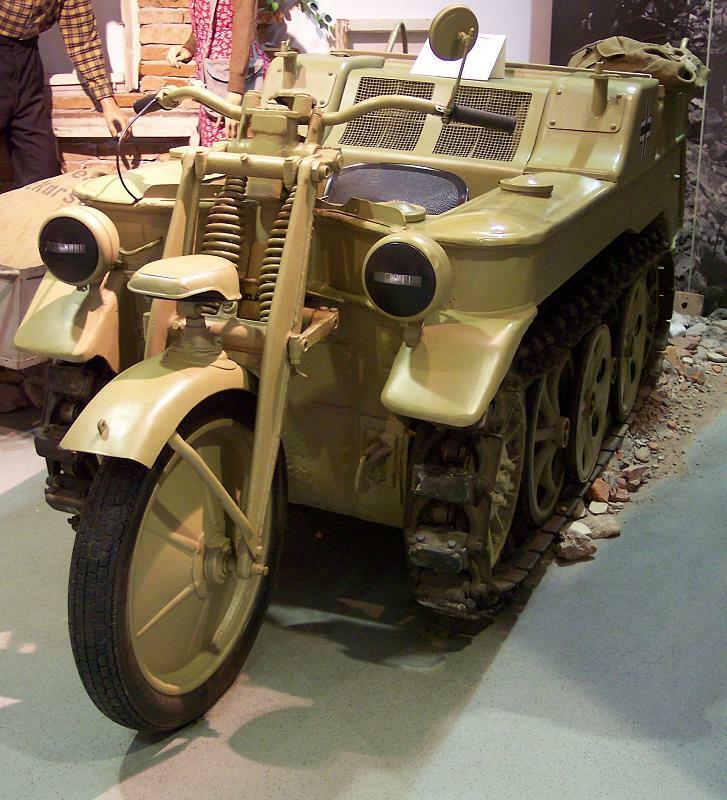 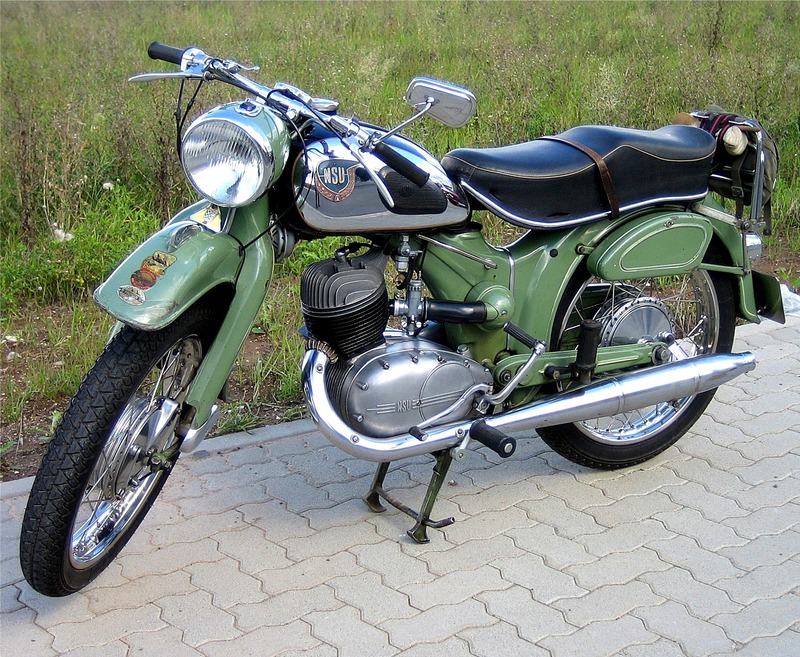 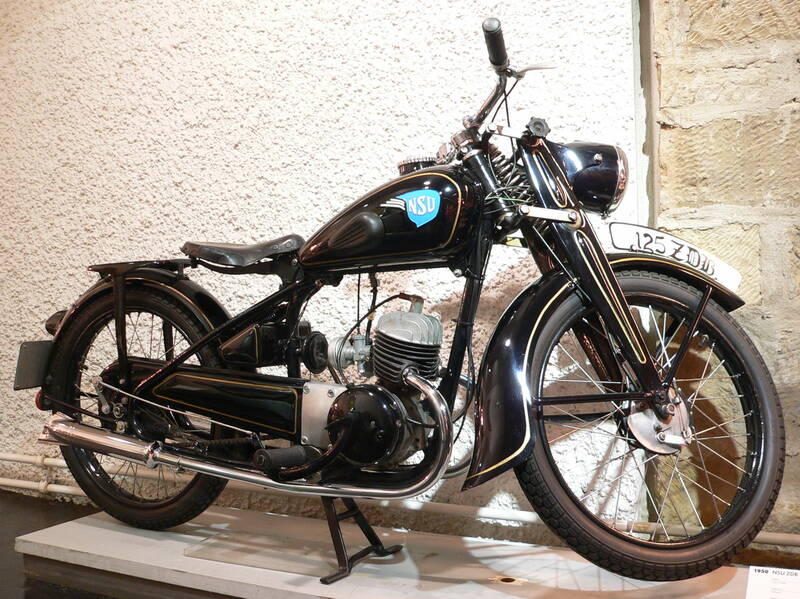 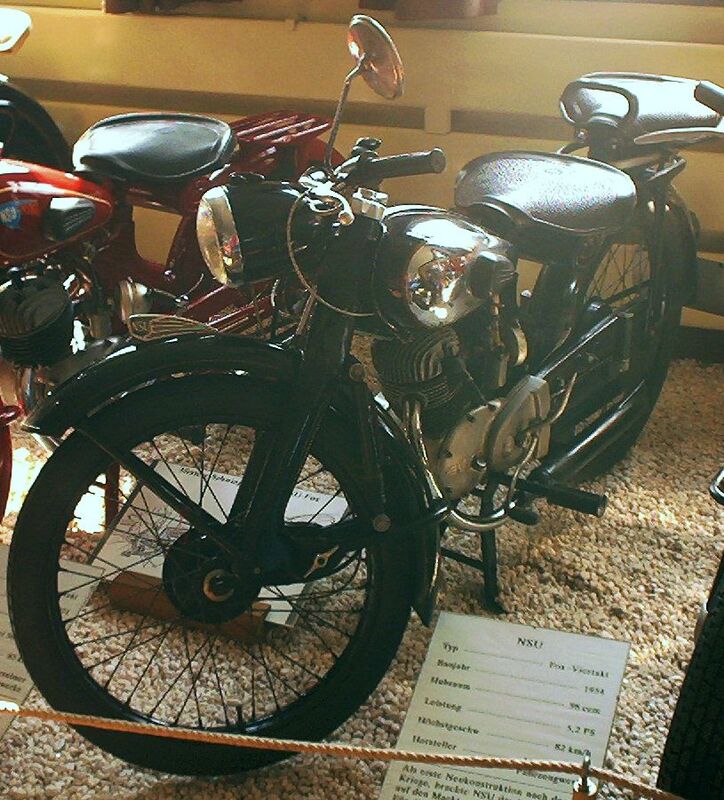 The first post-war model was the NSU Fox in 1949, available in a 2-stroke and a 4-stroke version. 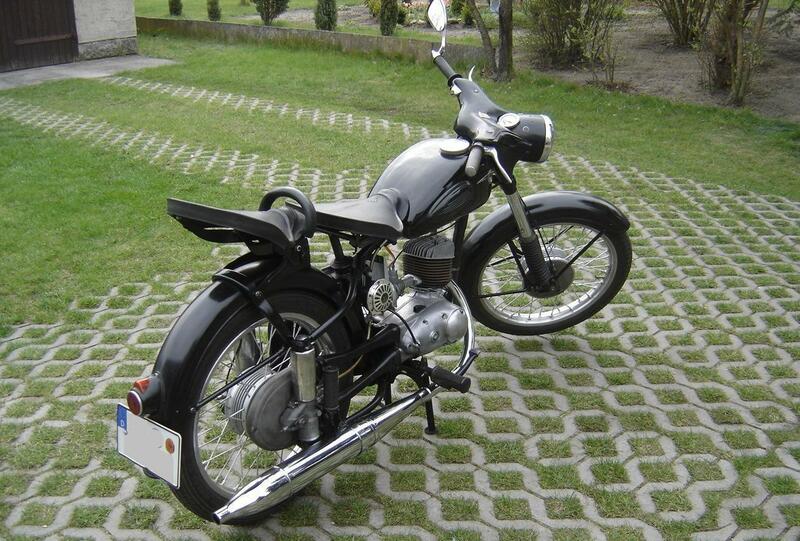 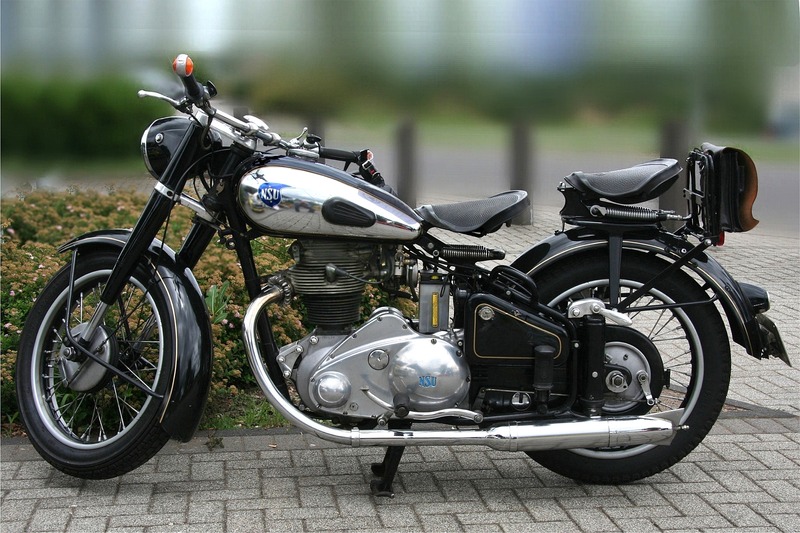 In 1953 the NSU Max followed, a 250 cc motorbike with a unique overhead camdrive with connecting rods. 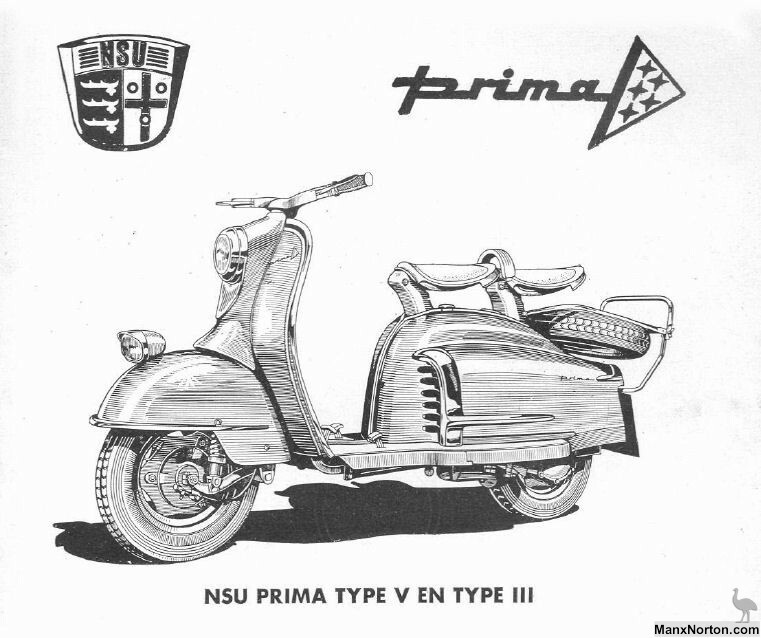 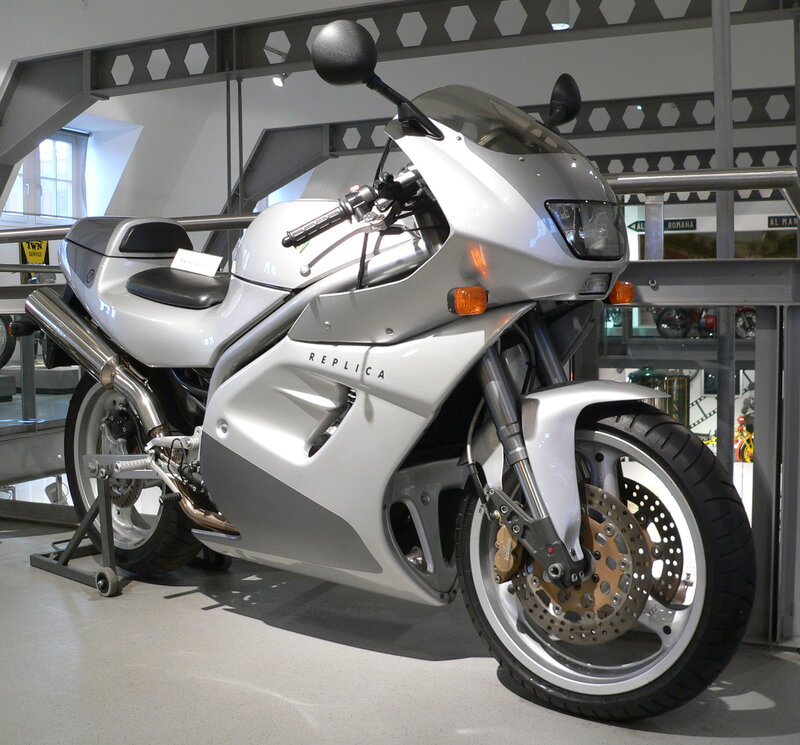 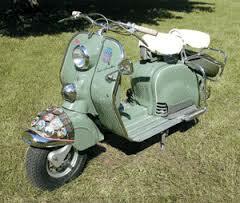 All these new models had an innovative monocoque frame of pressed steel and a central rear suspension unit. 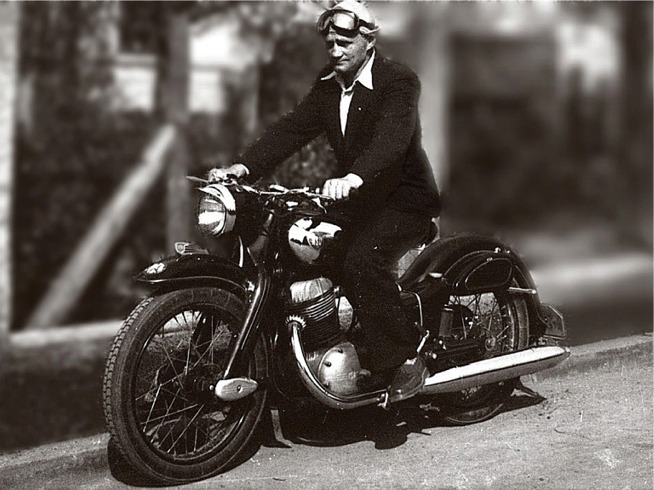 Albert Roder, the chief engineer behind the success story, made it possible that in 1955 NSU became the biggest motorcycle producer in the world. 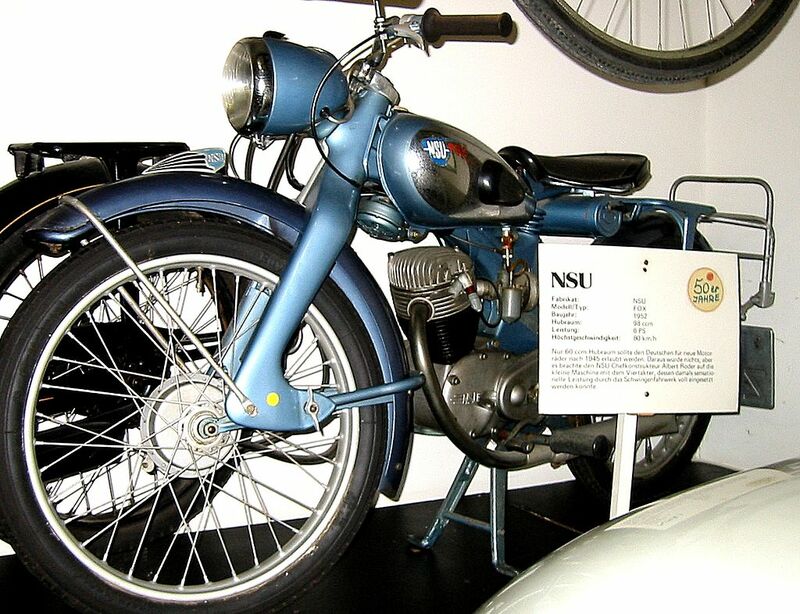 NSU also holds four world records for speed: 1951, 1953, 1954, and 1955. 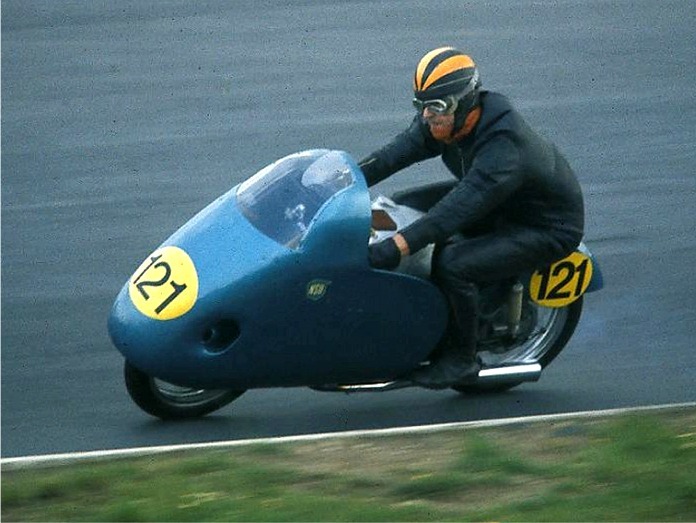 In August 1956 Wilhelm Herz at the Bonneville Salt Flats, Utah, became the first man to ride a motorcycle faster than 200 mph (322 km/h). 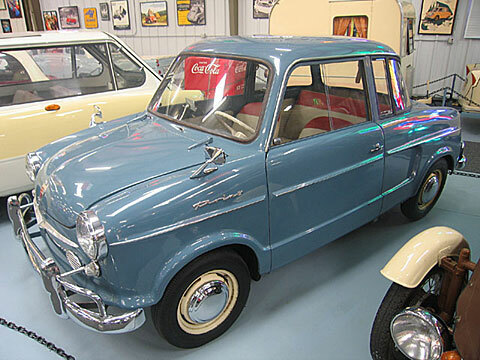 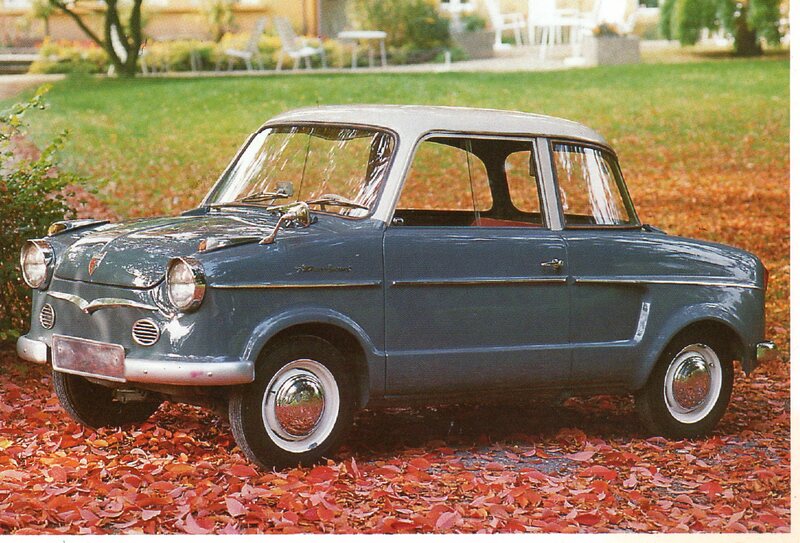 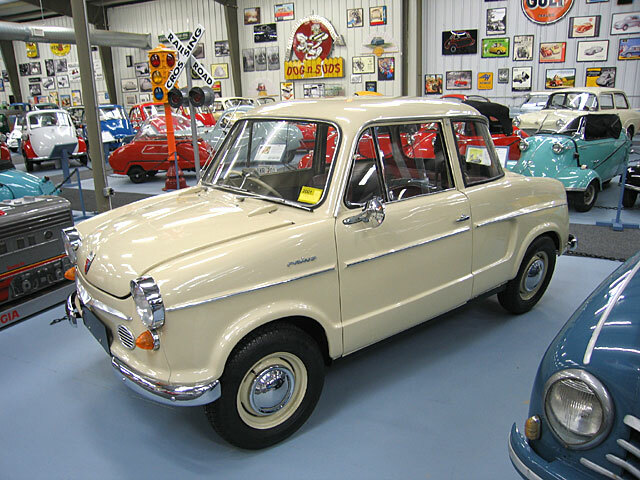 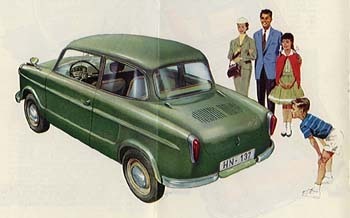 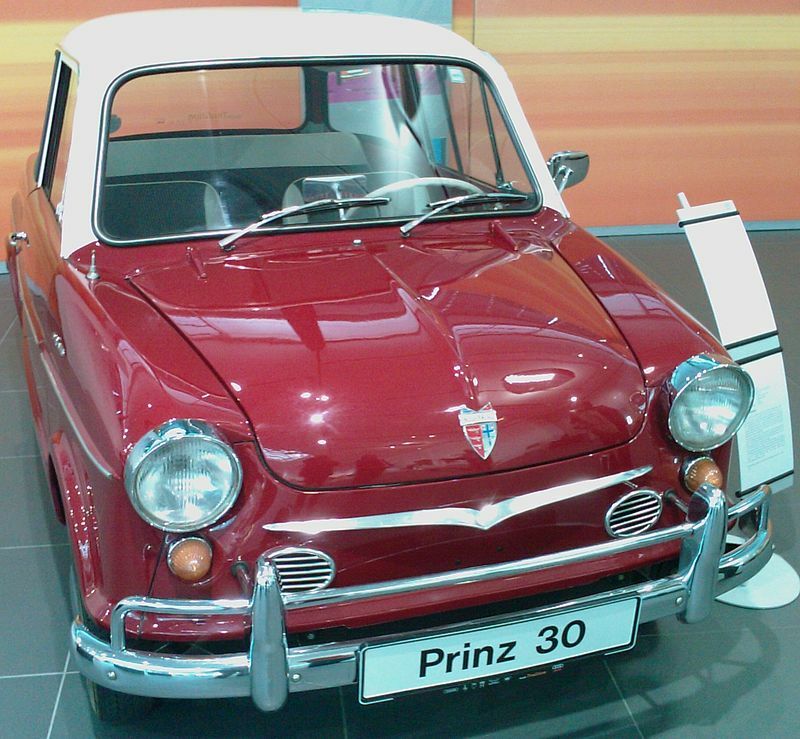 In 1957 NSU re-entered the car market with the new Prinz (Prince), a small car with a doubled NSU Max engine, an air-cooled two-cylinder engine of 600 cc (37 cu in) and 20 hp (15 kW). 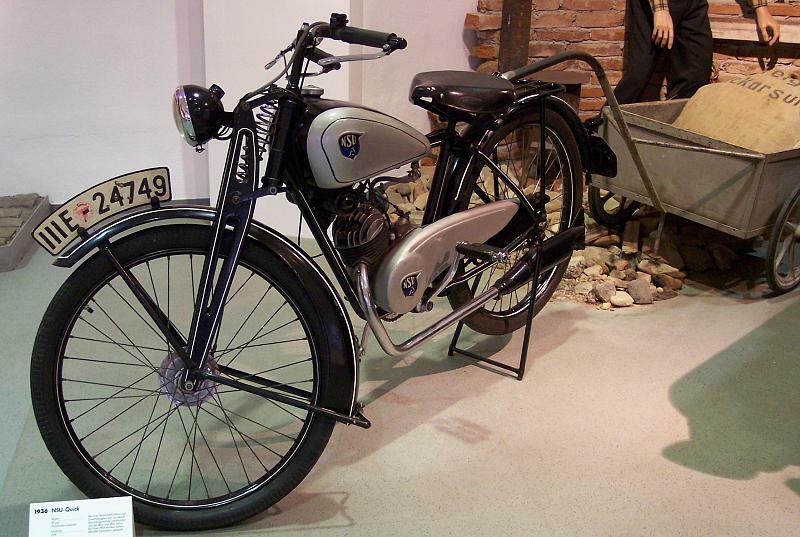 Motorbike production continued until 1968. 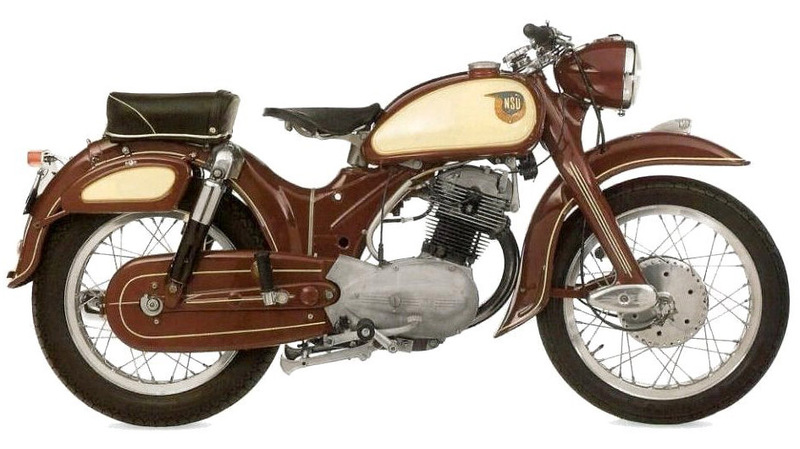 NSU’s last production motorcycle was the Quick 50. 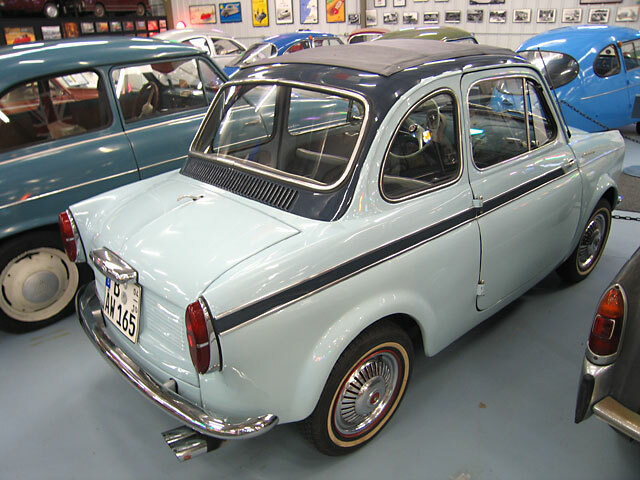 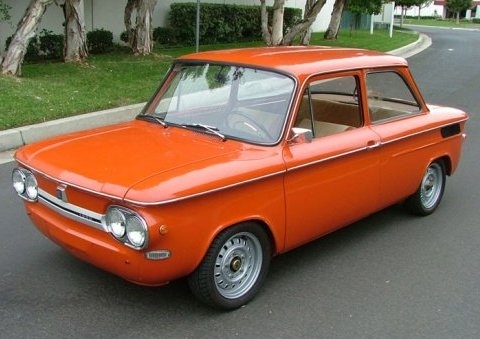 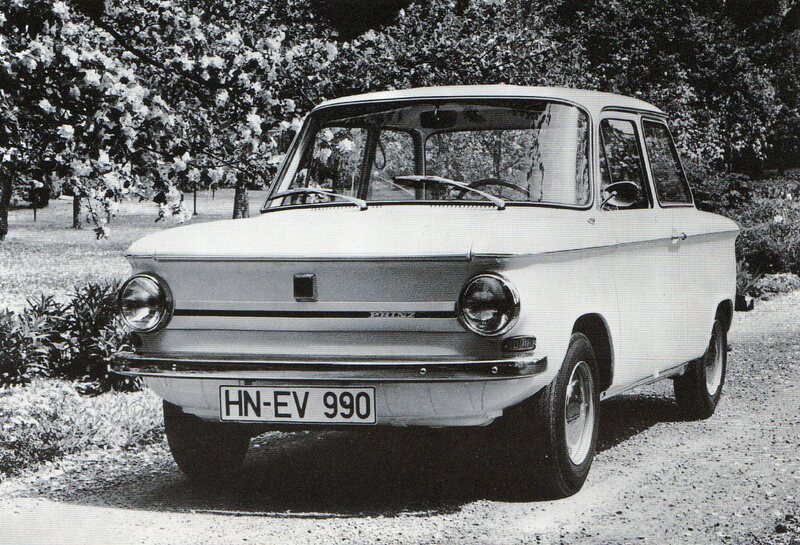 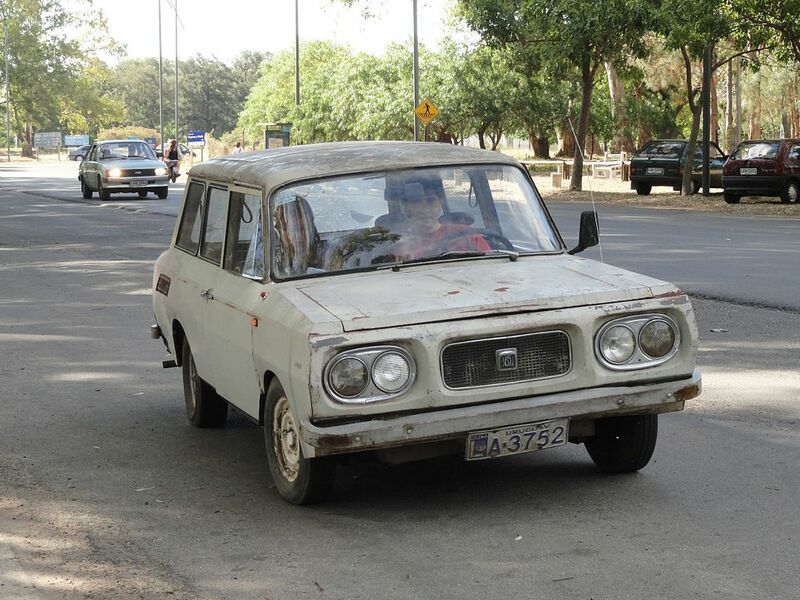 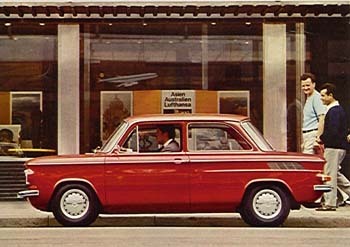 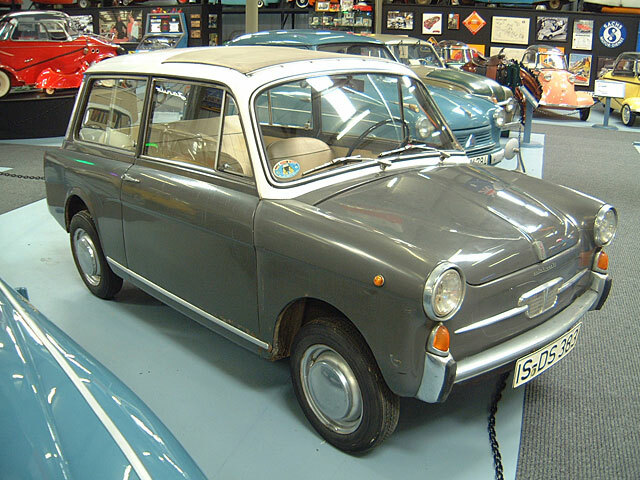 In 1967, the four-door NSU Ro 80, with a 115 hp (86 kW) version of the same 2-rotor, was presented to public. 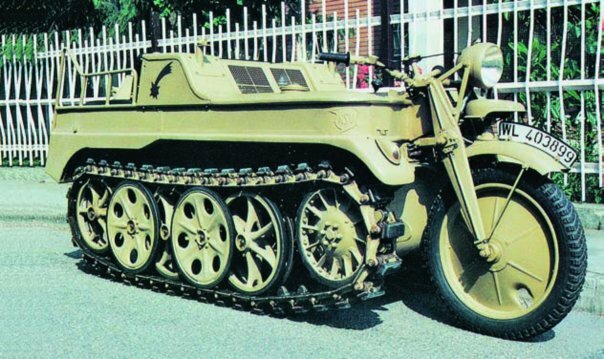 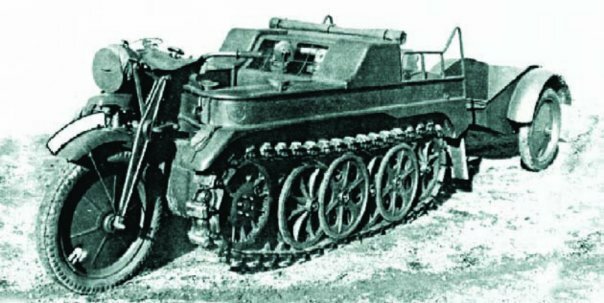 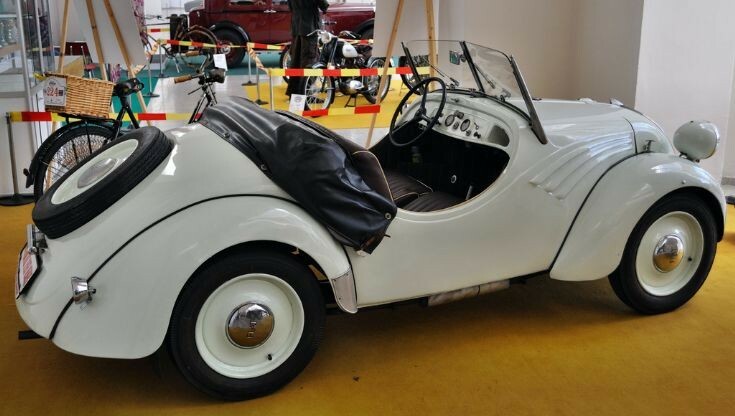 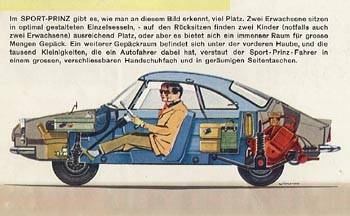 Weighing 2,600 lb (1,200 kg), it had a Cd of 0.36, disc brakes, independent suspension, and front wheel drive by Fichtel & Sachs Saxomatic three-speed transmission. 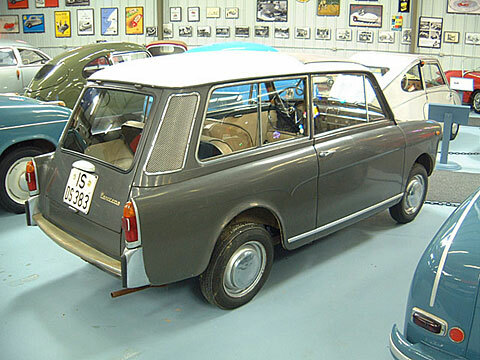 It soon gained several design awards such as “car of the year 1967”, while drivers liked its performance. 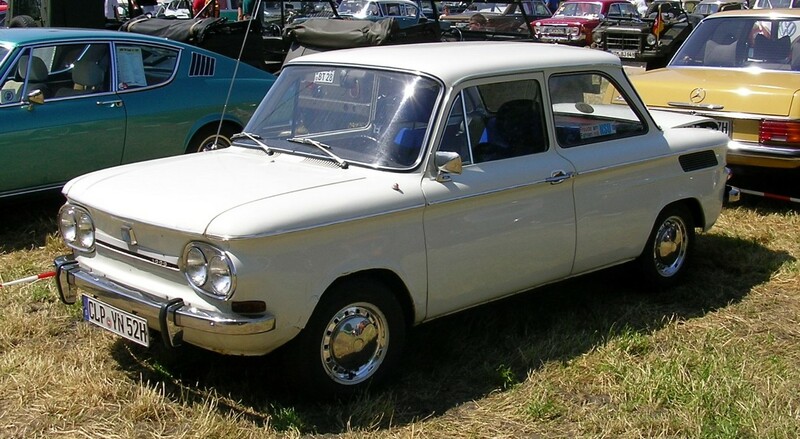 Virtually all the world’s major motor manufacturers purchased licenses from NSU to develop and produce the rotary engine, with the notable exception of BMW. 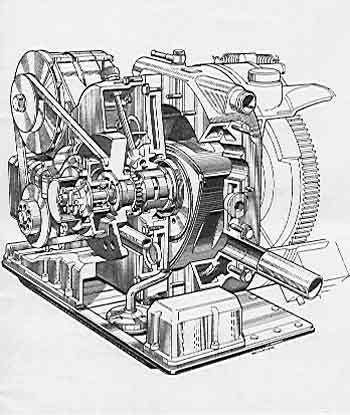 The development of the rotary engine was very cost-intensive for the small company. 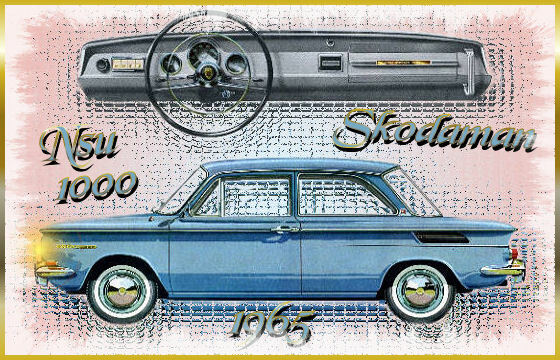 Problems with the tip seals of the engine rotor significantly damaged the brand’s reputation amongst consumers. 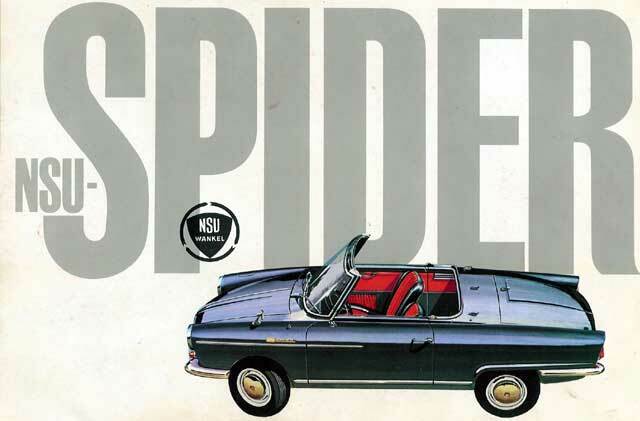 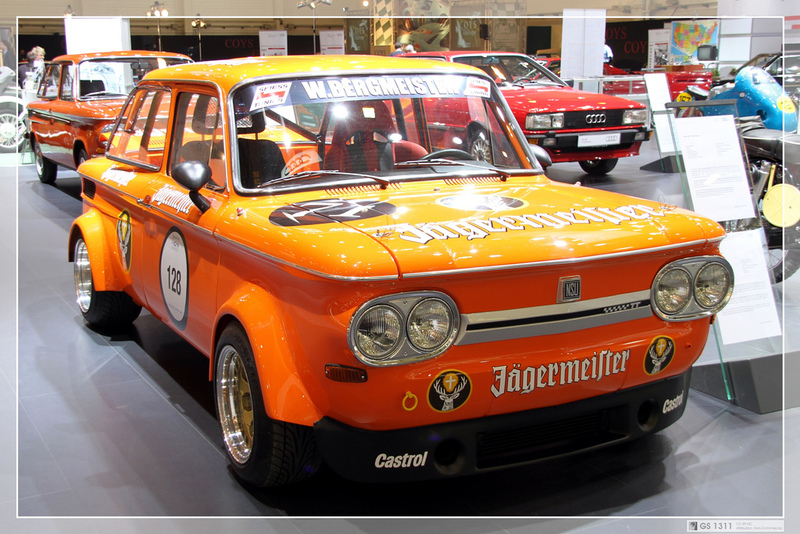 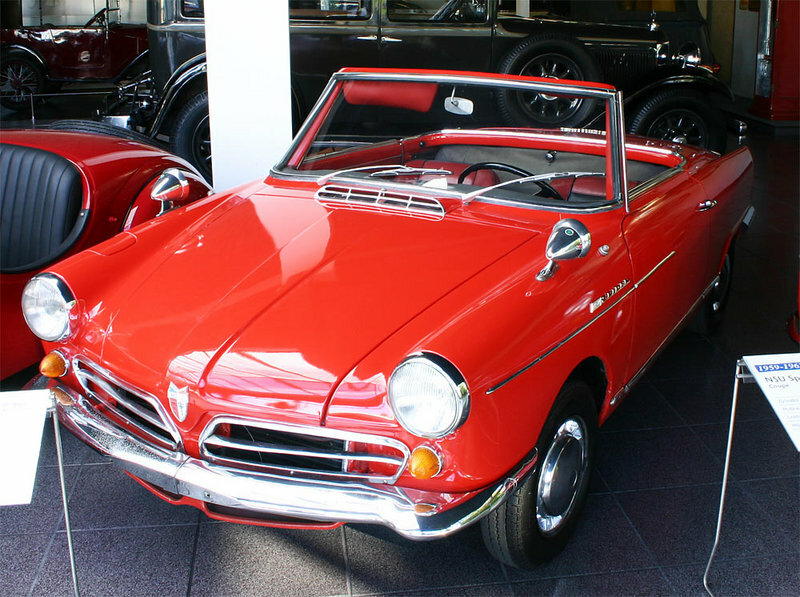 In 1969, the company was taken over by Volkswagenwerk AG, who merged NSU with Auto Union. 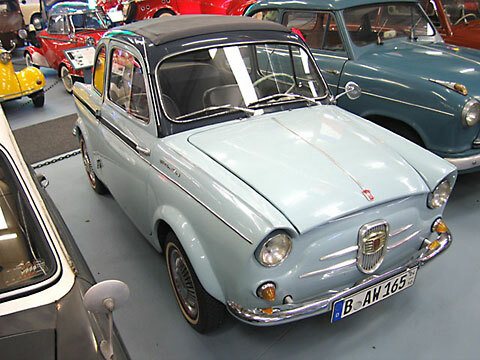 The new company was called Audi NSU Auto Union AG and represented the effective end of the NSU marque with all future production to bear the Audi badge (although retaining the four interlocking circles of Auto Union). 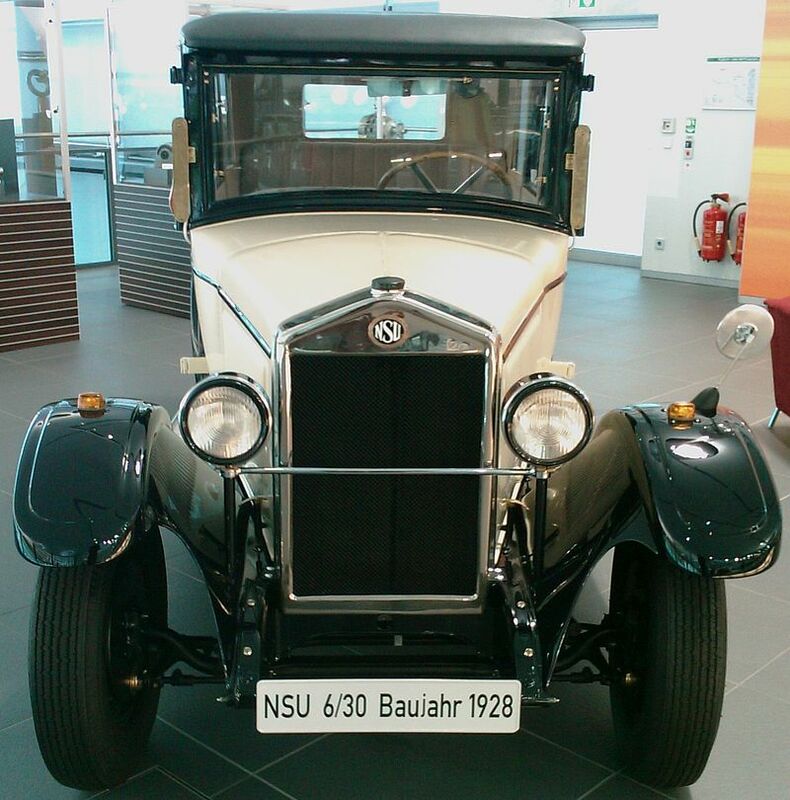 The management of the Neckarsulm plant moved to Audi’s headquarters in Ingolstadt. 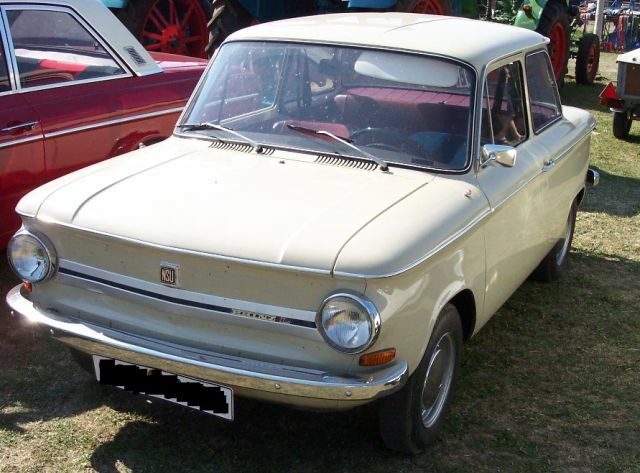 When the small rear-engined NSU models (Prinz 4, 1000, 1200) were phased out in 1973, the Ro 80 was the last car still in production carrying the NSU badge. 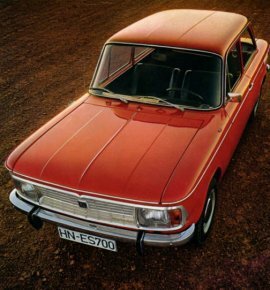 Audi never made use of the brand name NSU again after April 1977, when the last Ro 80 was sold. 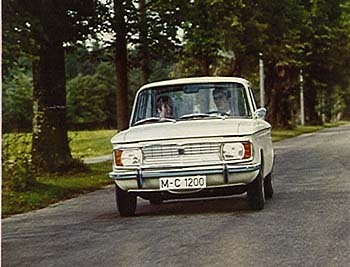 Even as production of the Ro 80 continued in the Neckarsulm plant, production of larger Audi models like 100 and 200 was started. 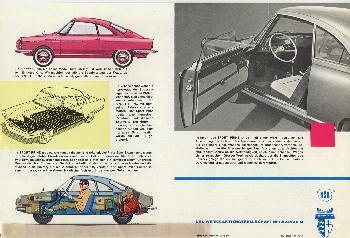 The Porsche 924 and later Porsche 944 were also assembled at Neckarsulm. 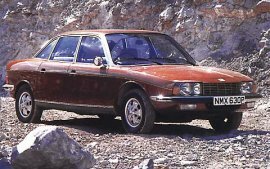 Those models were joint venture projects of Porsche and VW, but Porsche did not have the internal capacity to build the 924 and 944. 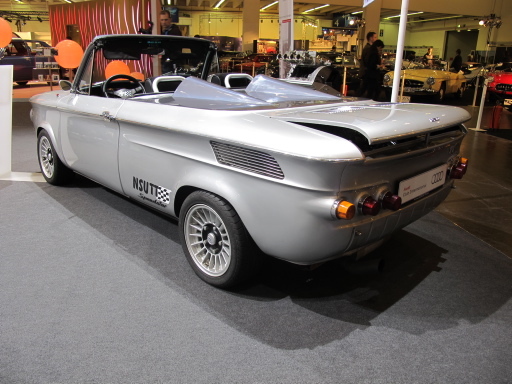 Currently, Neckarsulm is the production plant for Audi’s topline vehicles like A6, A8 and R8. 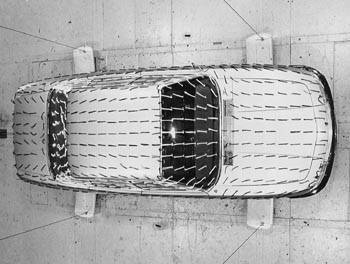 It is also the home of the “Aluminium- und Leichtbauzentrum” where Audi’s aluminium-made space frame bodies are designed and engineered. 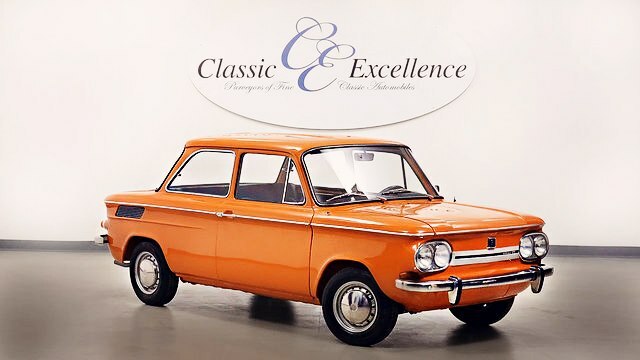 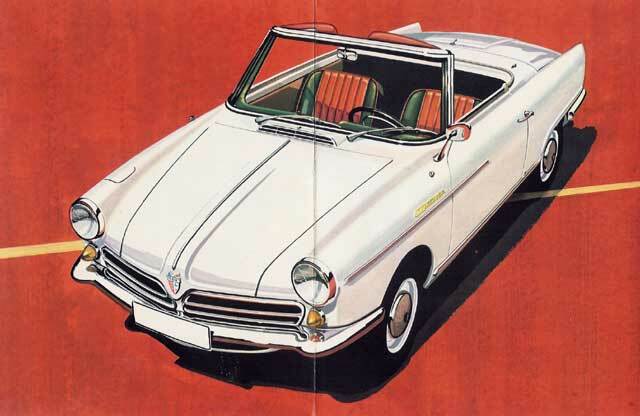 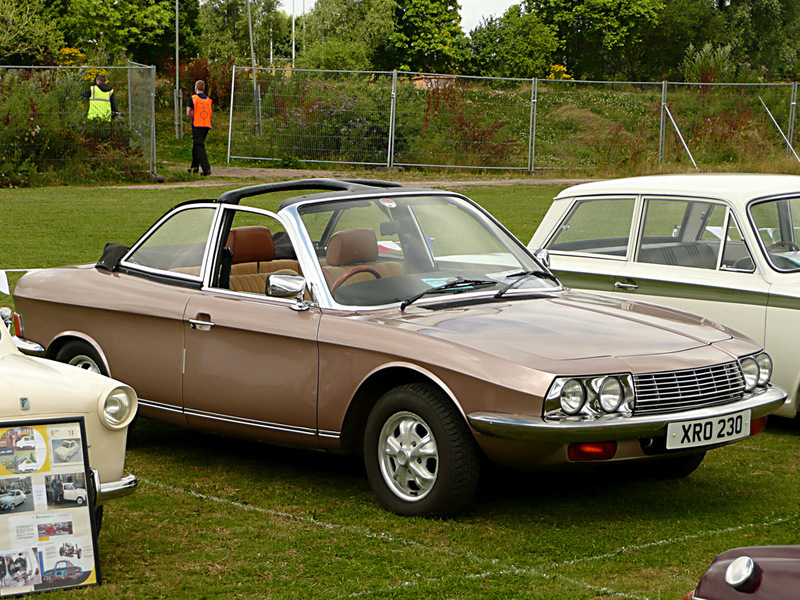 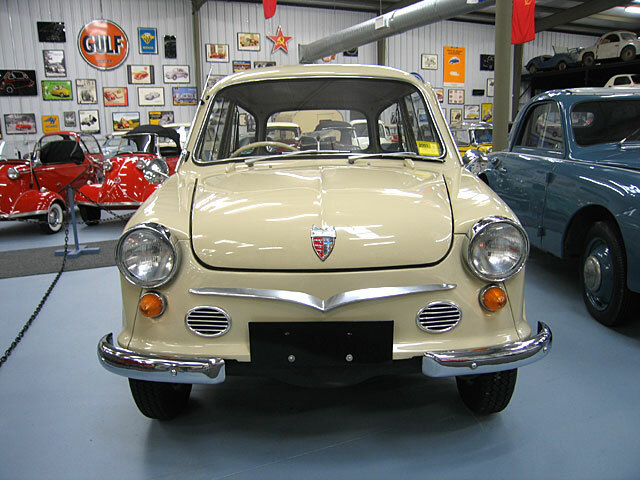 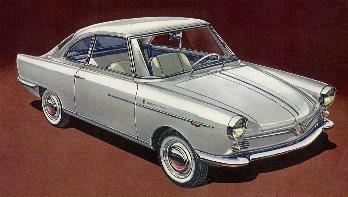 NSU is primarily remembered today as the first licensee and one of only three automobile companies to produce cars for sale with rotary Wankel engines. 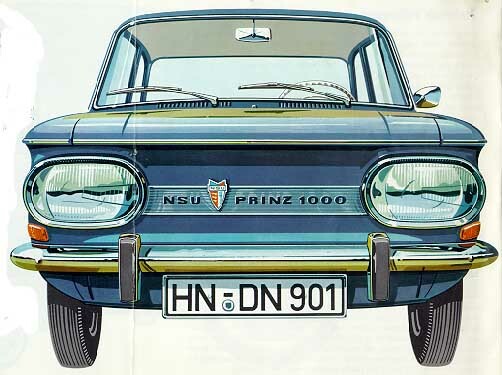 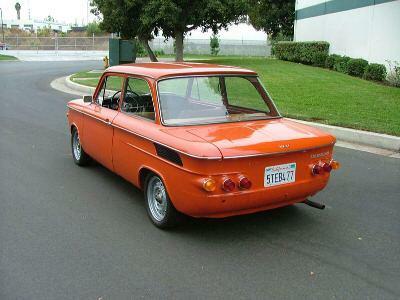 NSU invented the principle of the modern Wankel engine with an inner rotor. 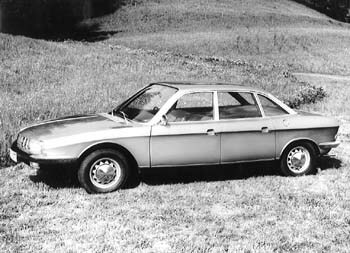 The NSU Ro 80 was the second mass-produced two-rotor Wankel-powered vehicle after the Mazda Cosmo. 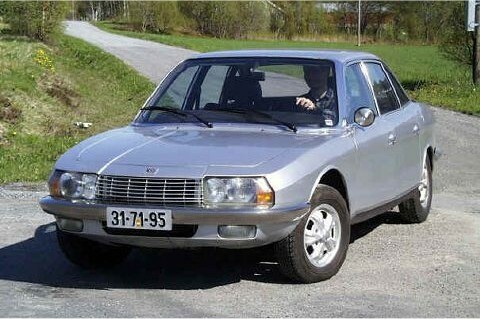 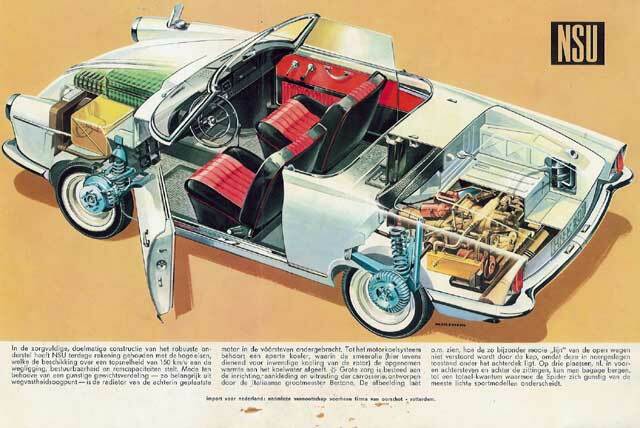 In 1967, NSU and Citroën set up a common company, Comotor, to build engines for Citroën and other car makers. 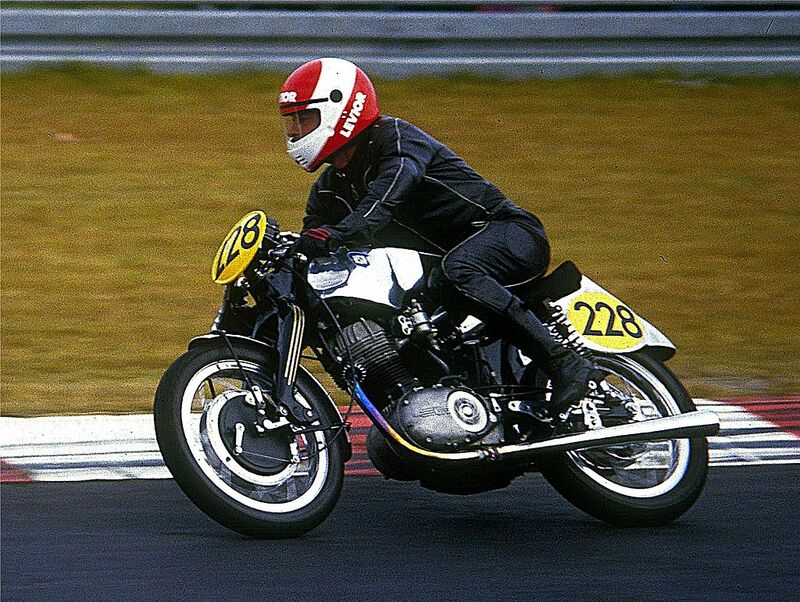 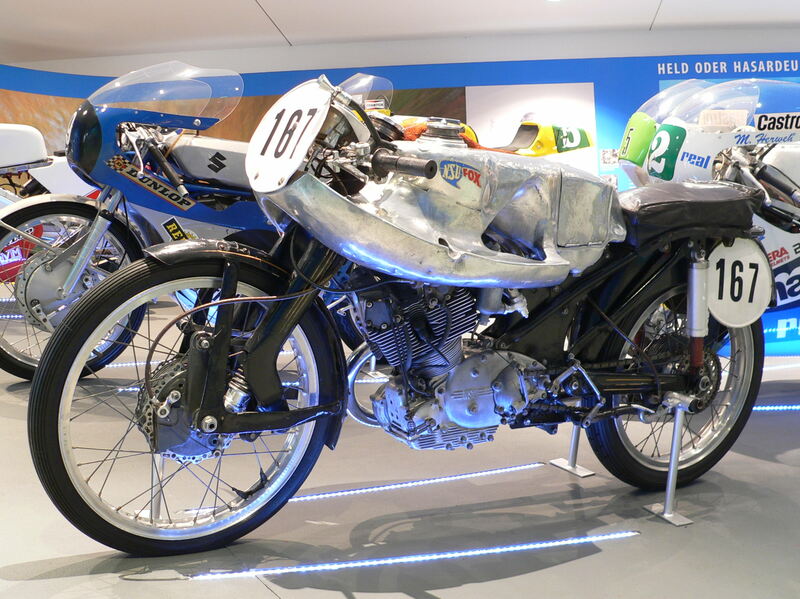 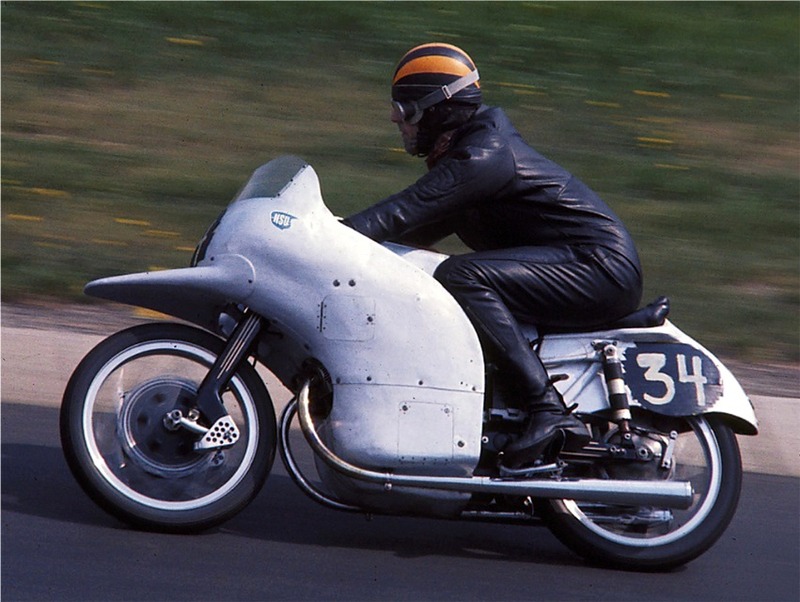 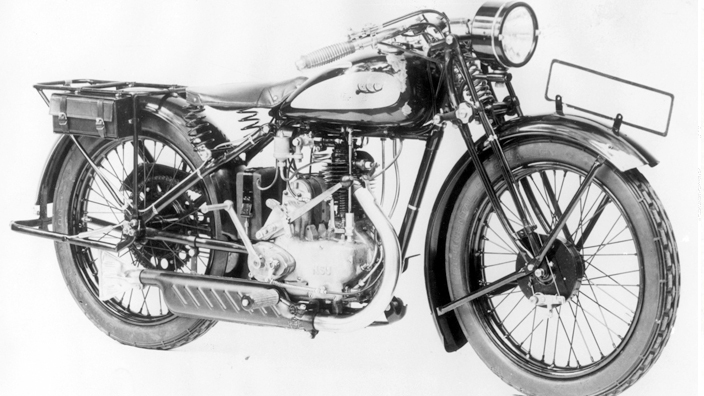 Norton made motorcycles using Wankel engines. 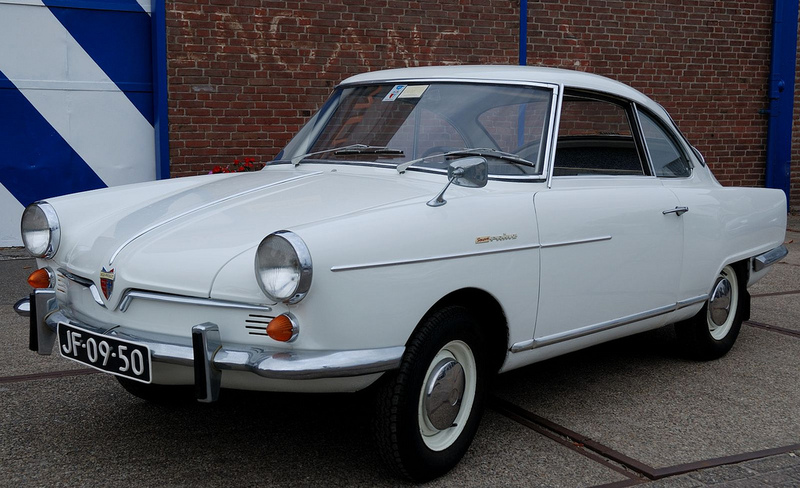 Only Mazda has continued developing the Wankel engine and made several more cars with the Wankel Engine. 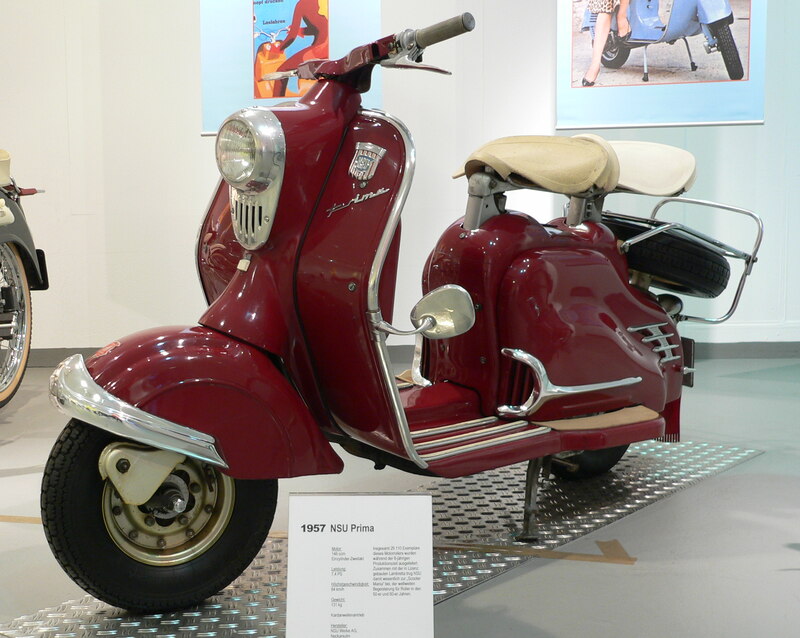 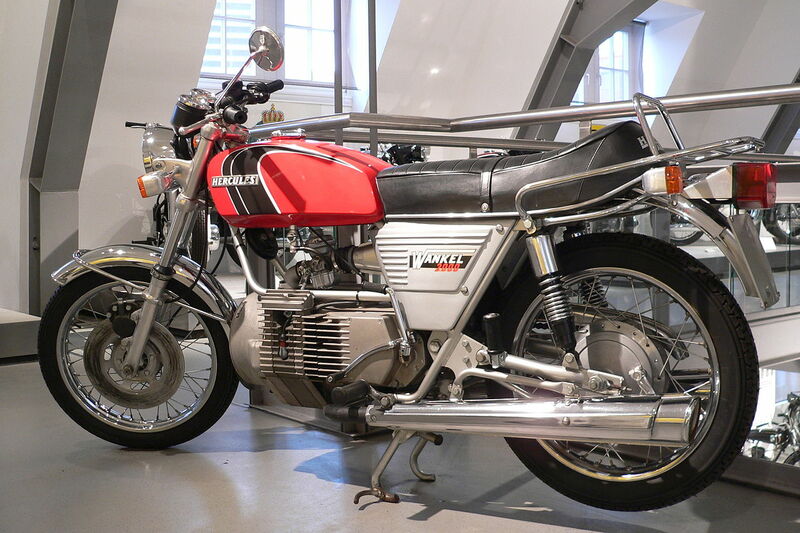 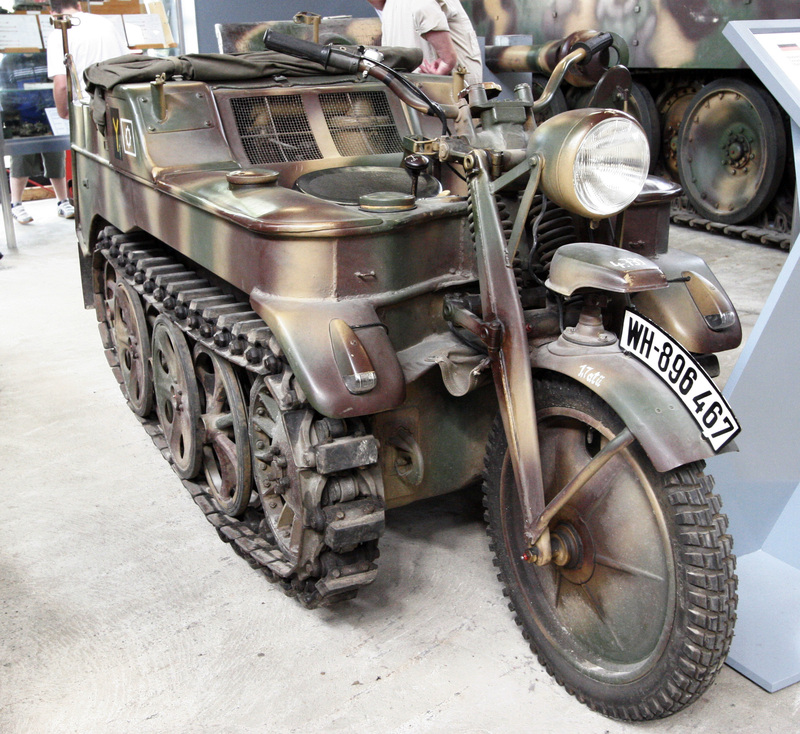 A museum in Neckarsulm, the Deutsches Zweirad- und NSU-Museum, has many of NSU’s products on display. 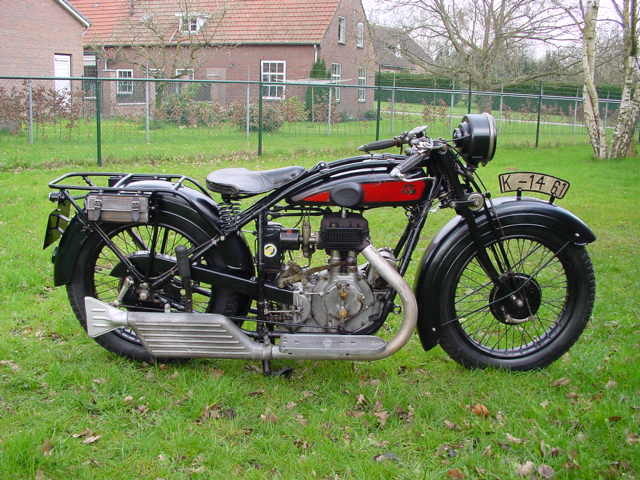 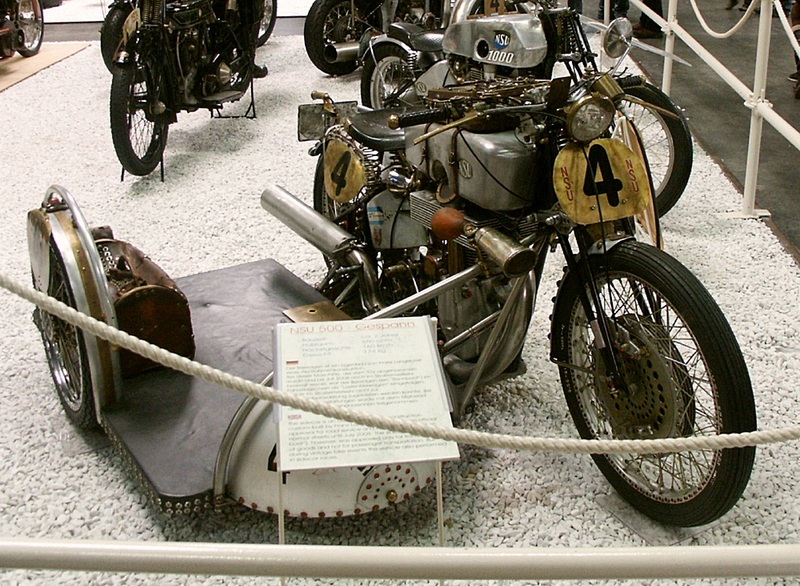 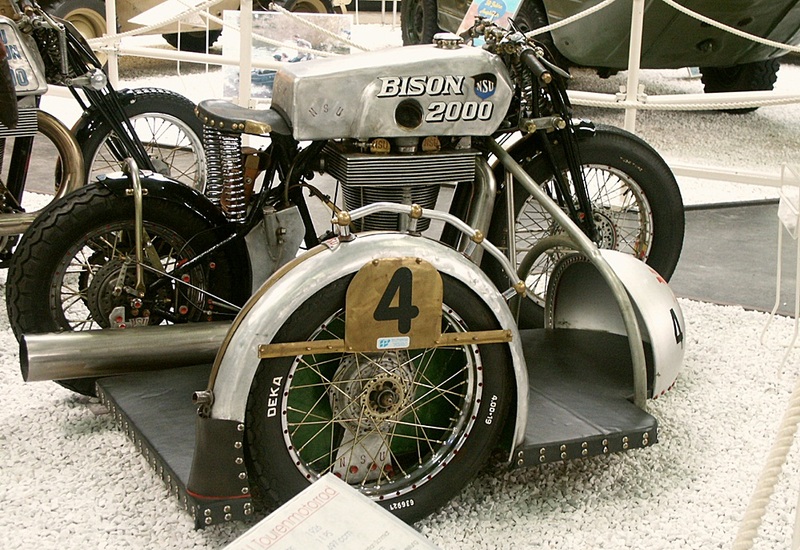 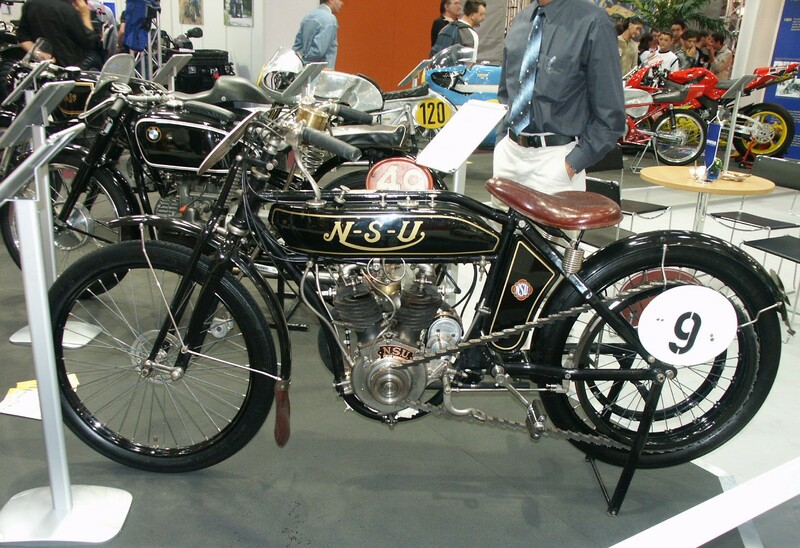 In 1907, British manager Martin Geiger rode an NSU in the inaugural Isle of Man TT, placing fifth. 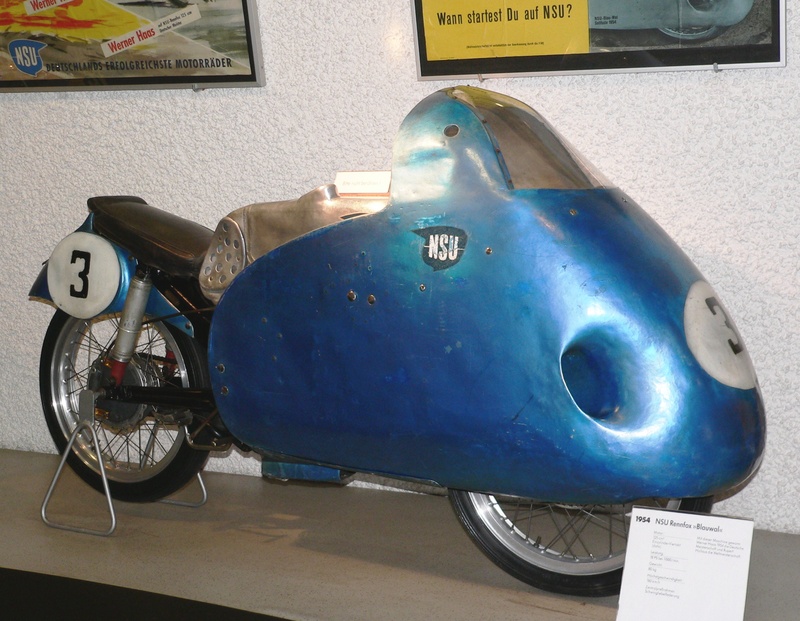 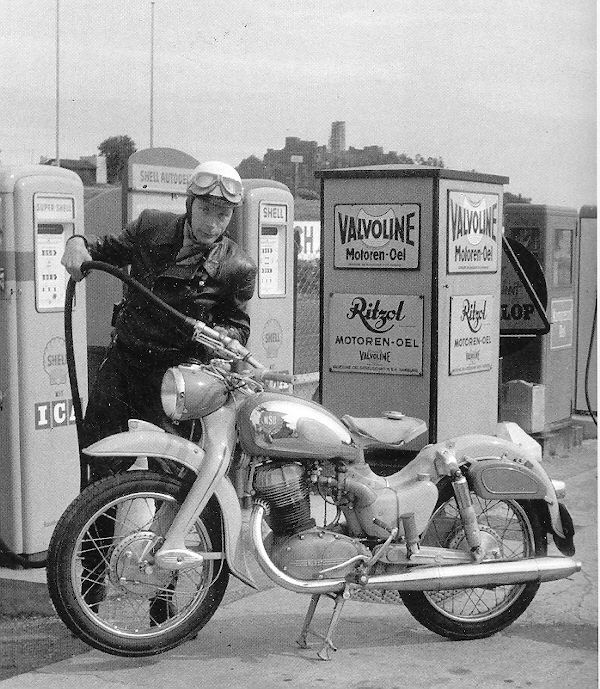 NSU had several successes in the Isle of Man TT races in the 1950s. 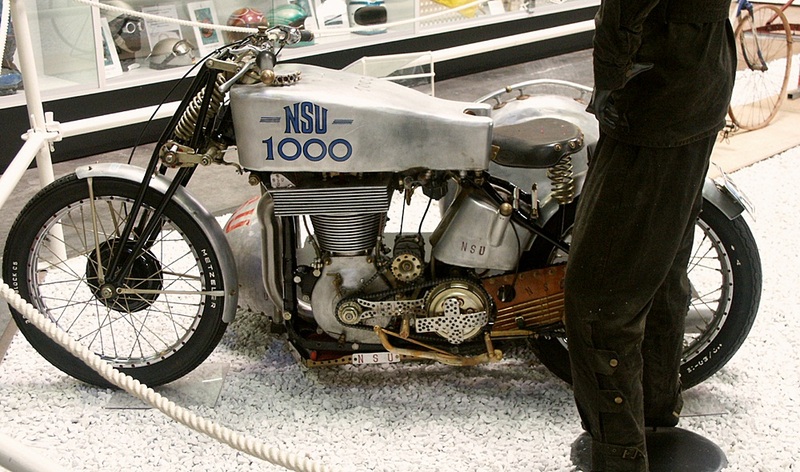 NSU holds 4 World records for speed: 1951, 1953, 1954 and 1955. 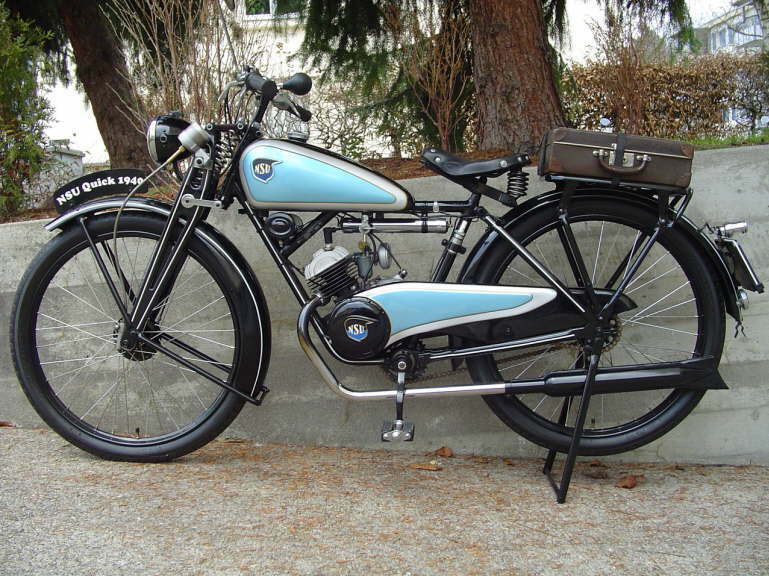 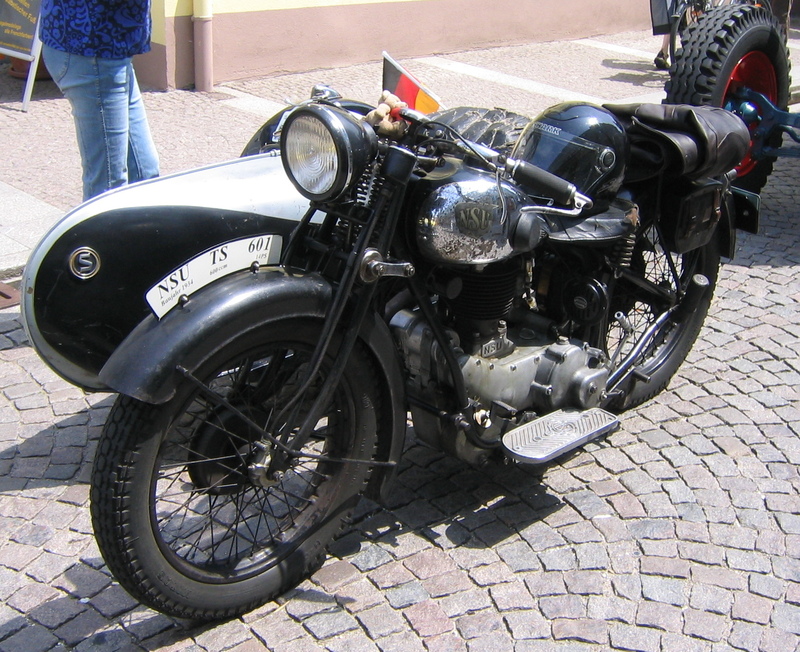 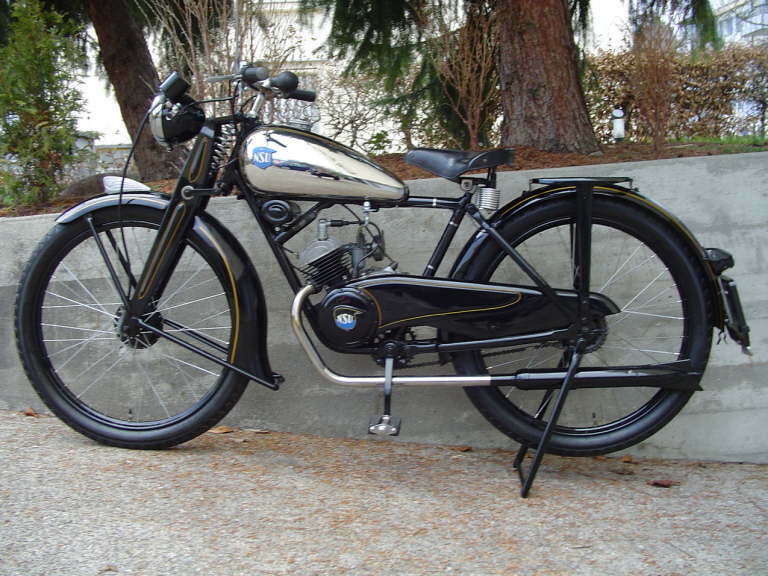 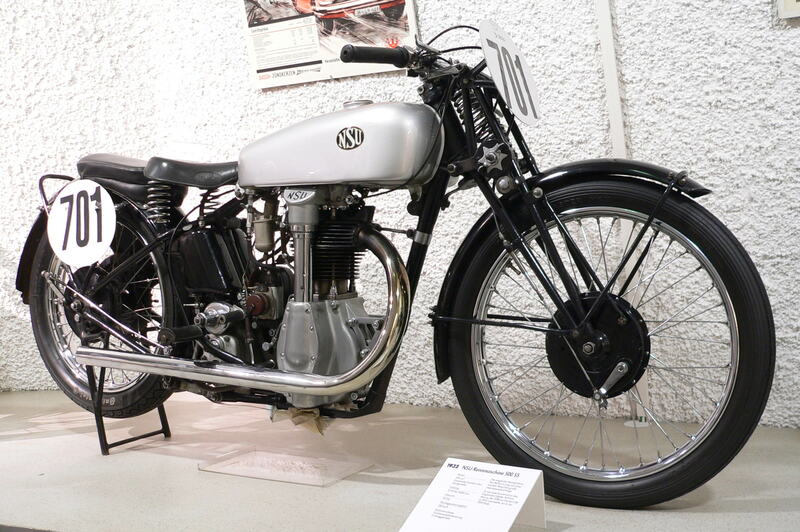 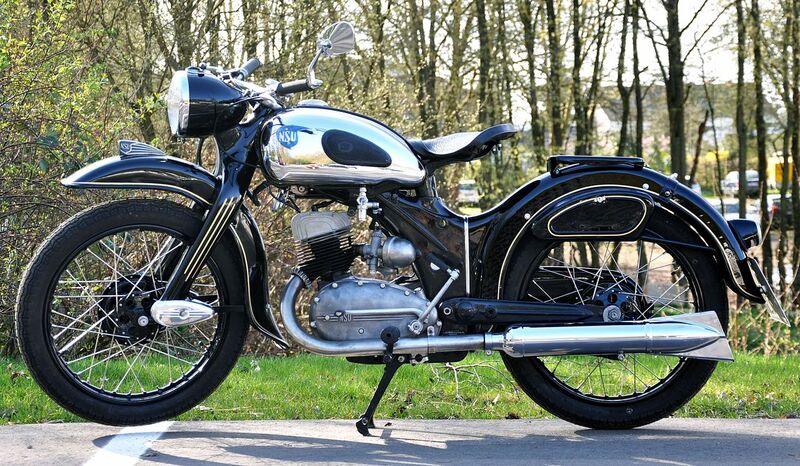 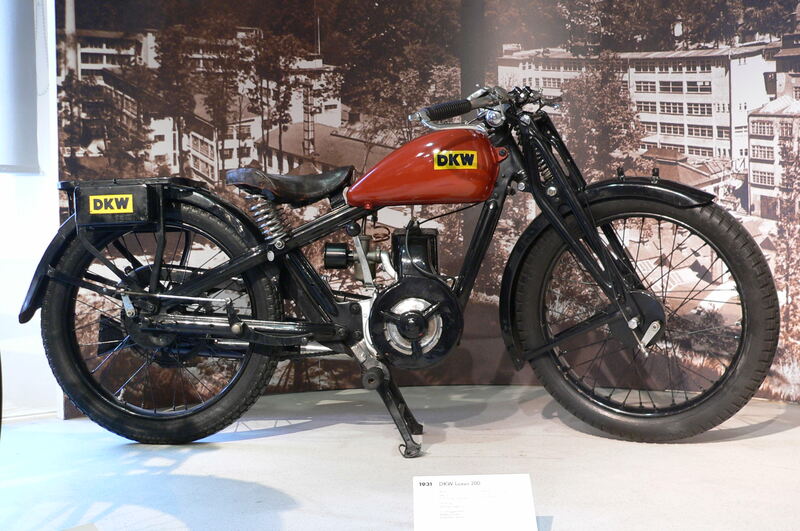 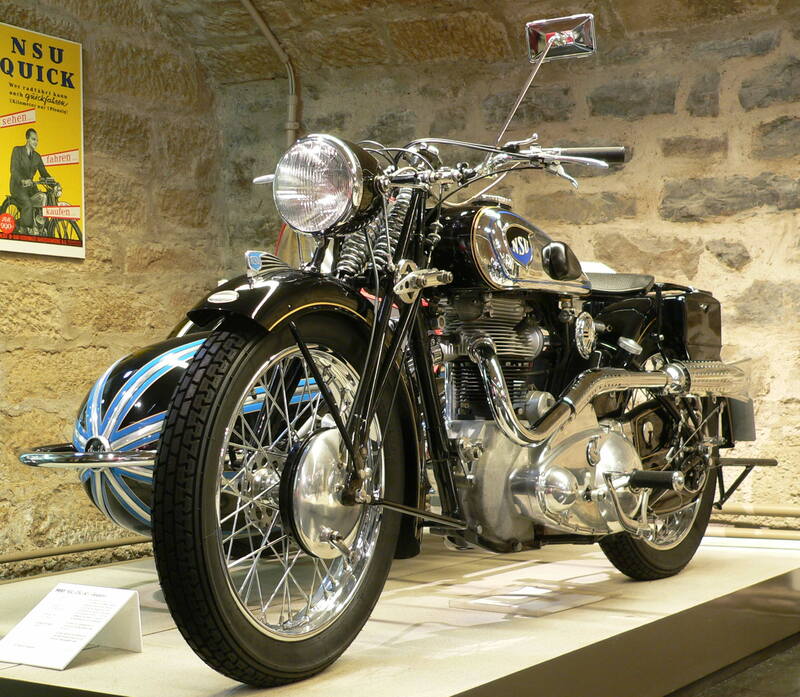 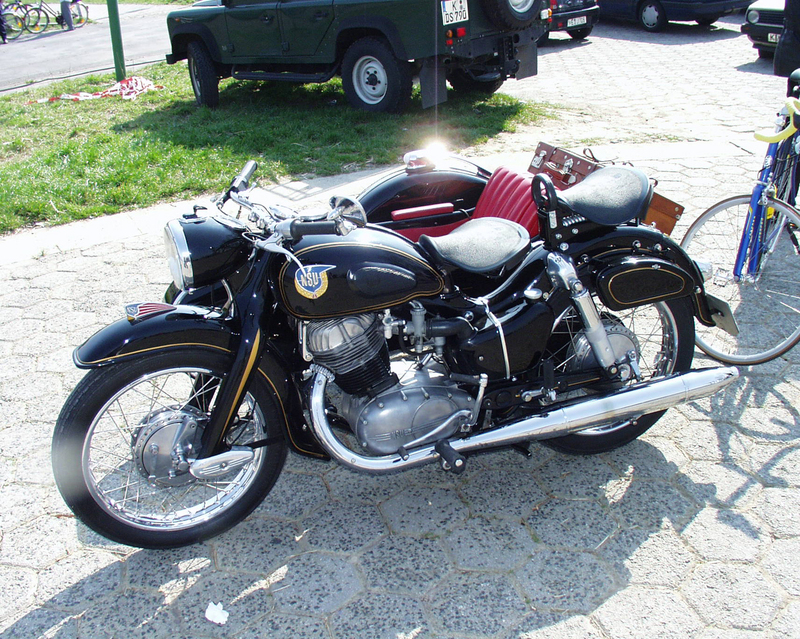 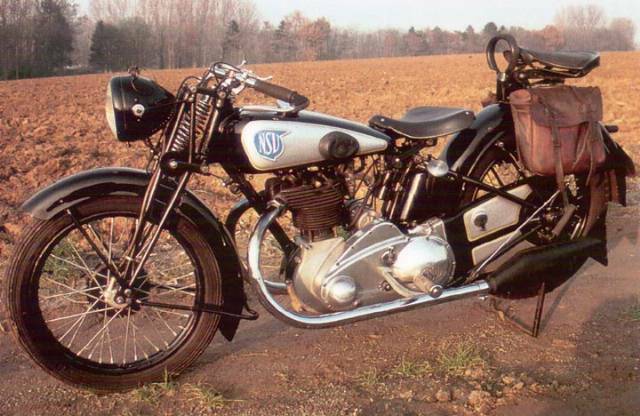 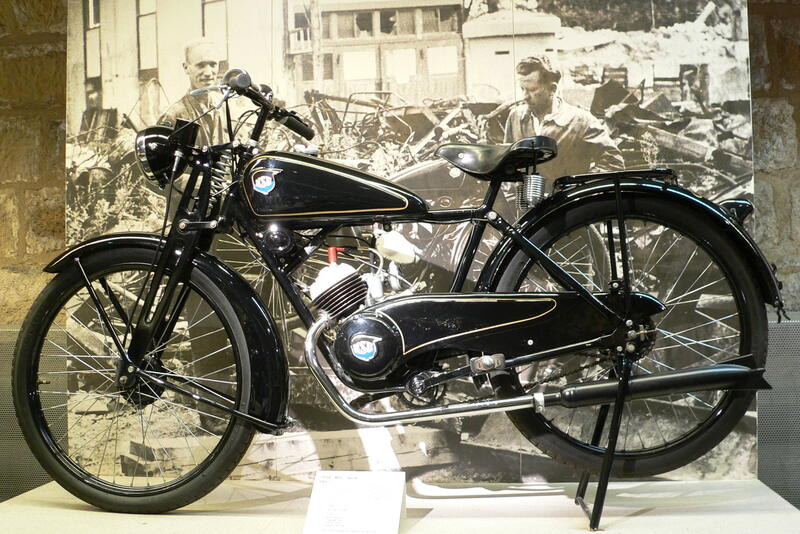 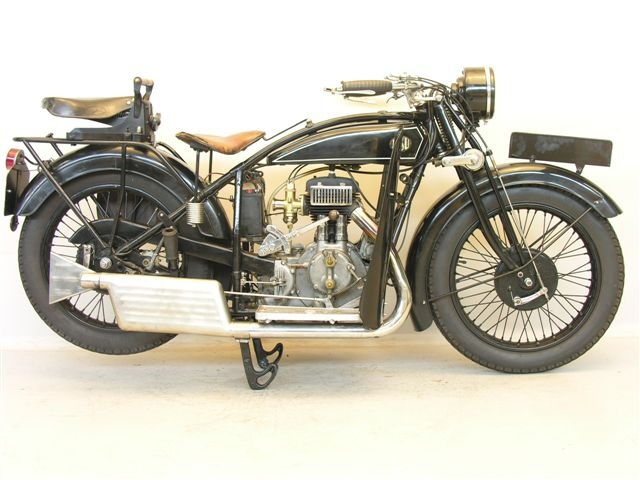 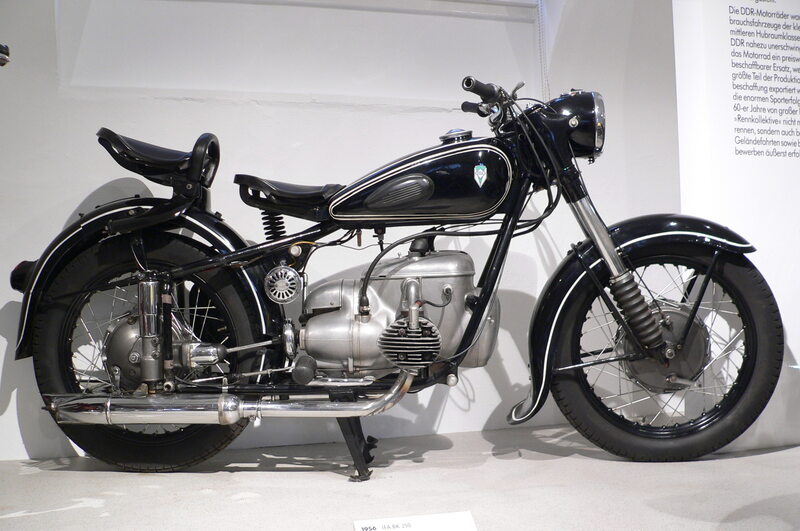 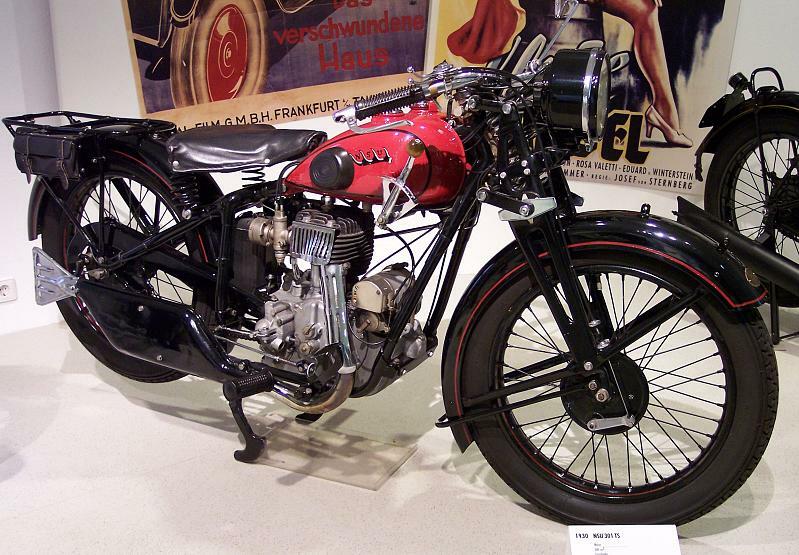 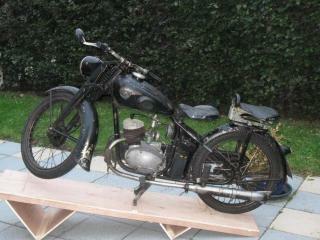 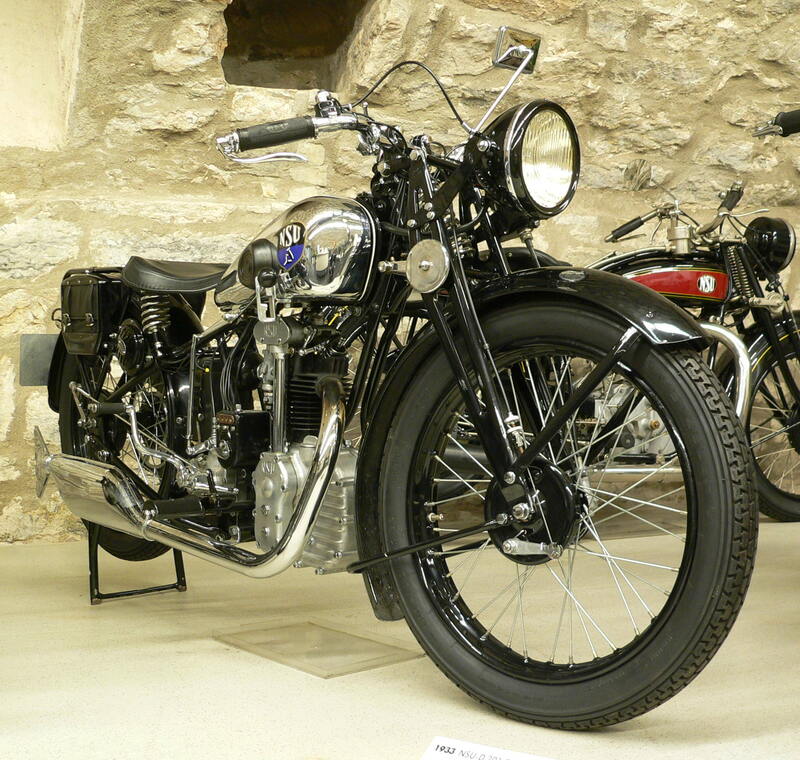 During the 1930s, and in the mid 1950s NSU was the largest motorcycle producer of the world. 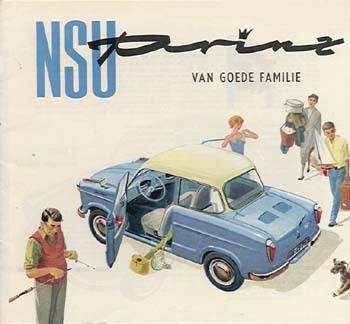 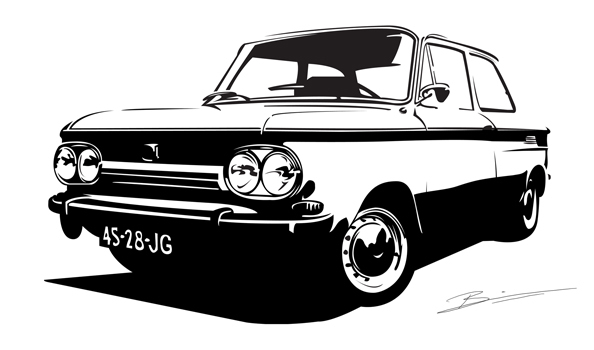 NSU was een Duitse fabrikant van breimachines, en later auto‘s en motorfietsen. 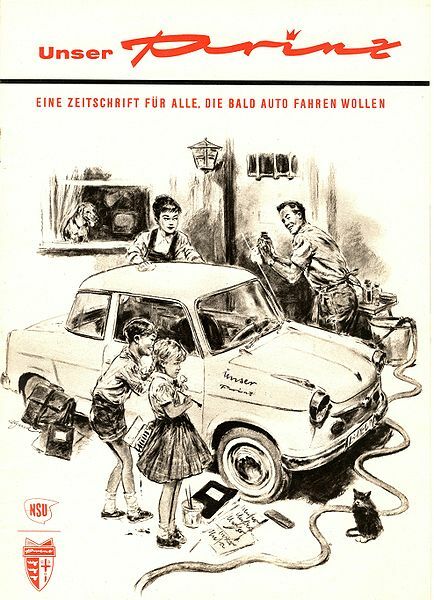 Het bedrijf werd in 1873 opgericht, en in 1969 door Volkswagen AG overgenomen. 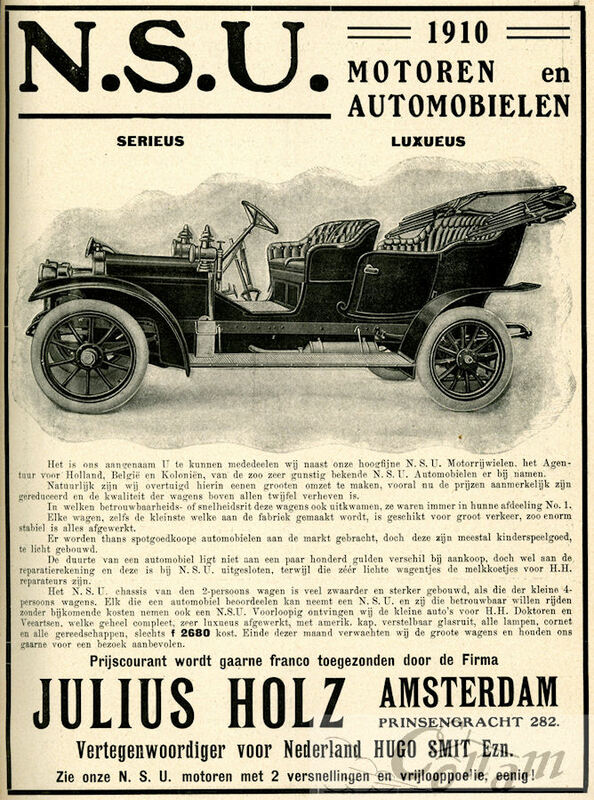 Na het overlijden van Schmidt in 1884 kwam de fabriek in handen van zijn zwager Gottlob Banzhaf (1858-1930) die in 1886 besloot over te stappen op de fabricage van tweewielers. 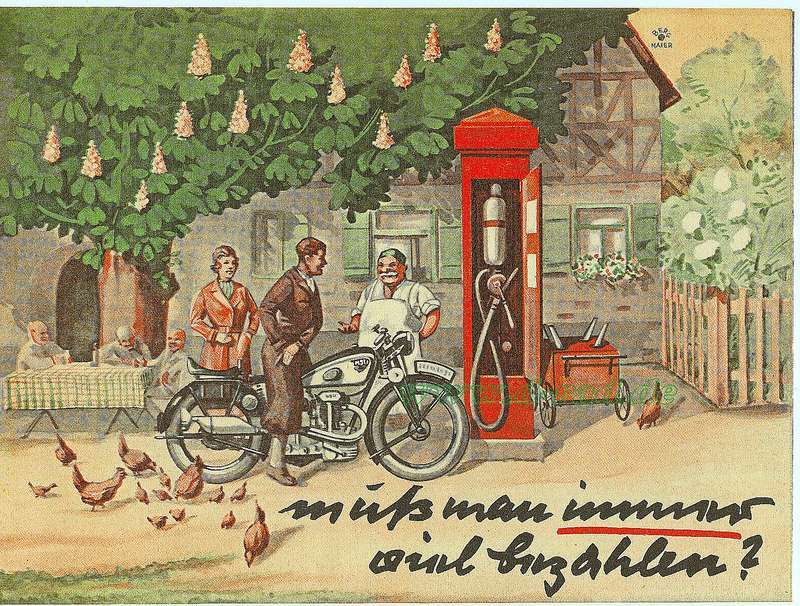 Banzhaf zag potentieel in het nieuwe vervoermiddel, en verwachtte met fietsen meer geld te kunnen verdienen dan met breimachines. 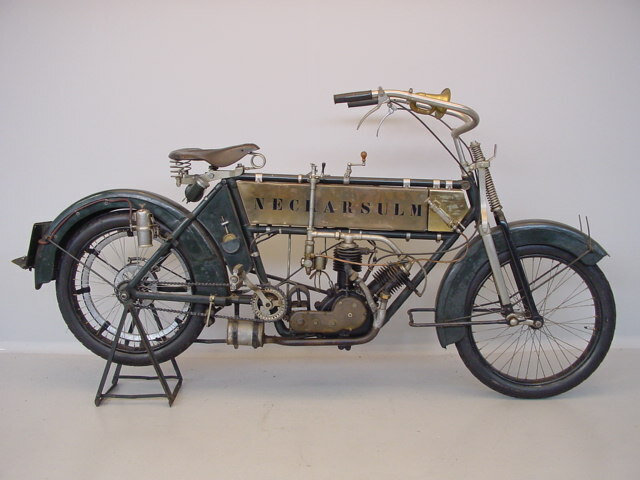 De “Germania”, een vélocipède, was het eerste product na de omschakeling, en vanaf 1888 legde men zich toe op de fabricage van lagere fietsen. 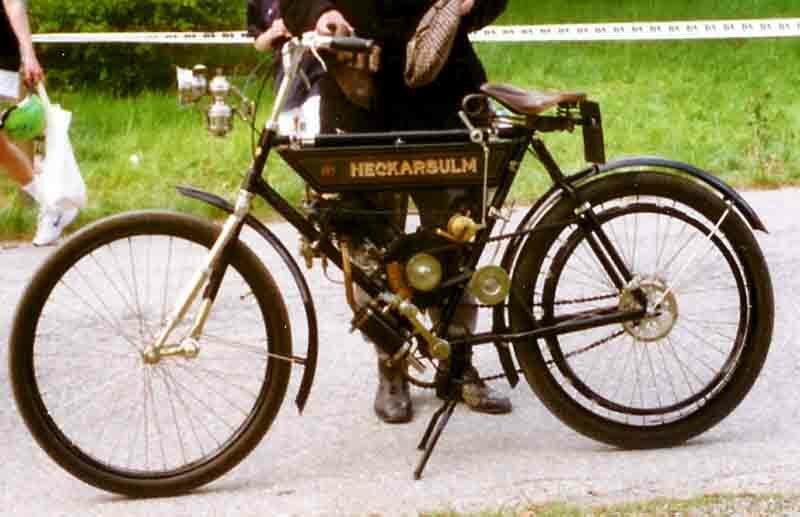 In 1901 produceerde men de eerste motorfiets met 1½ pk Zedel–clip-on motor. 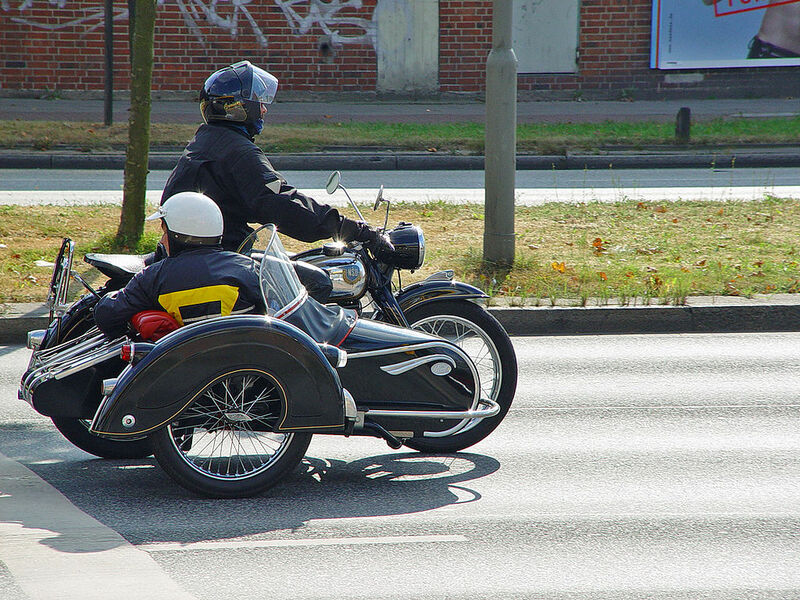 Al snel werden eigen motorblokken ontwikkeld. 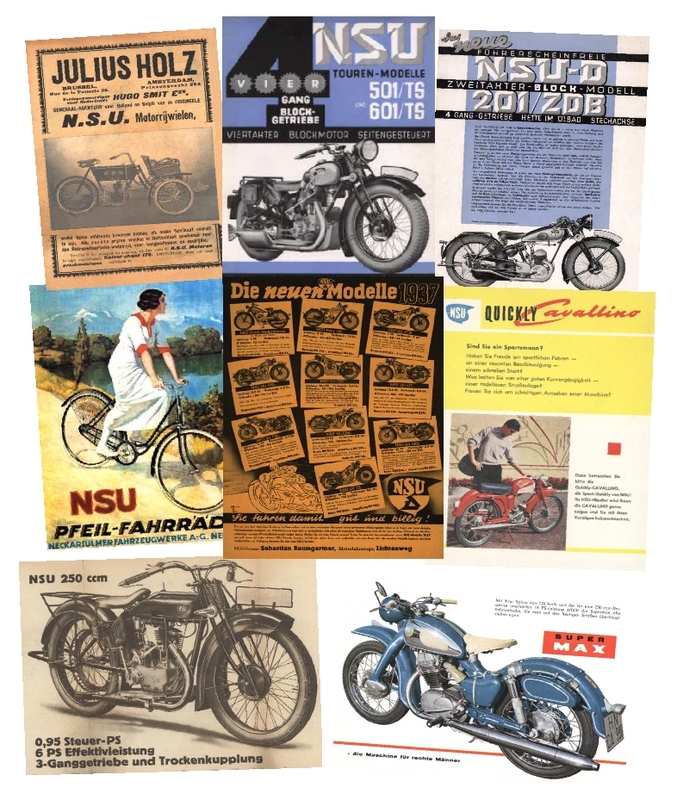 De machines werden aanvankelijk onder de naam Neckarsulm of Neckarsulmer Motorrad verkocht, maar deze naam was met name voor de Engelse klanten niet uit te spreken, daarom werd het al snel NSU, waarvoor de letters genomen werden uit de naam van de standplaats: NeckarSUlm. 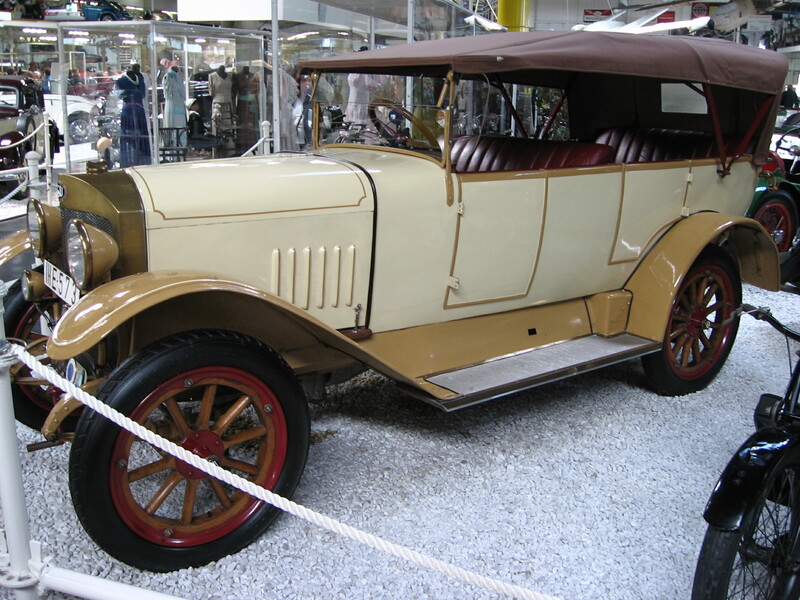 In 1905 werd de eerste auto gefabriceerd, in licentie van het Belgische merk Pipe. 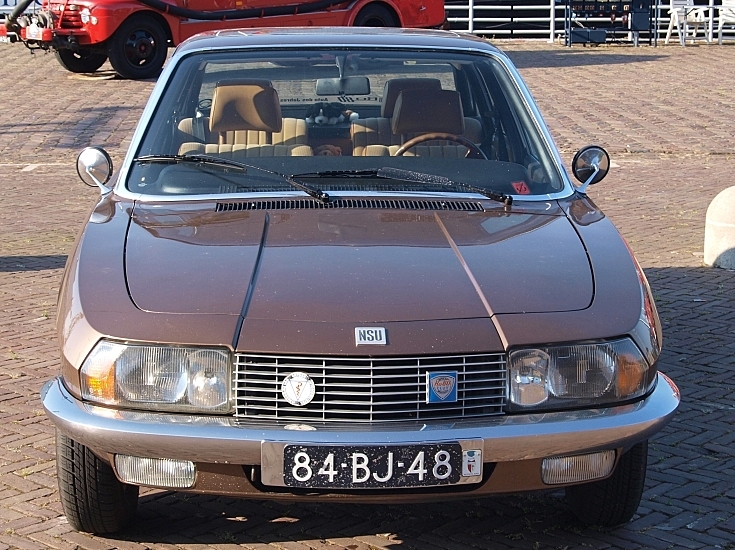 Tijdens de Tweede Wereldoorlog produceerde NSU uiteraard militair materieel, waaronder het bekende Kettenkrad dat tot 1949 werd geproduceerd. 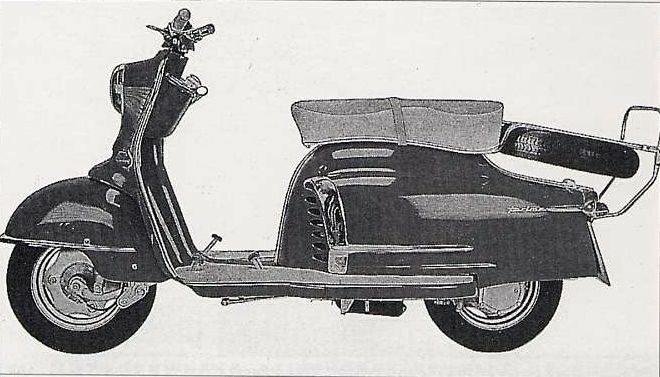 In 1949 begon men weer civiele motorfietsen te bouwen, maar al eerder, in 1947 werd een contract gesloten met Innocenti om de Lambretta–scooters in licentie te produceren. 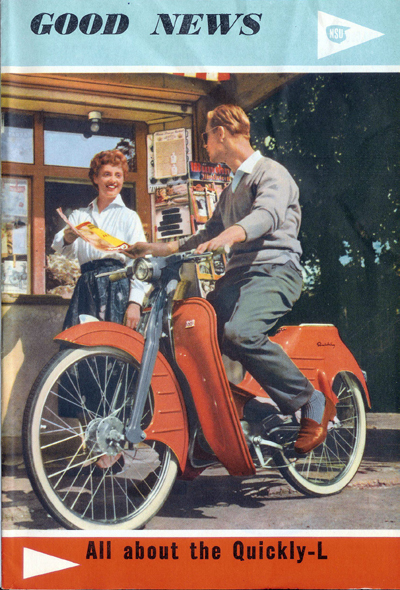 Aanvankelijk waren dit in Italië geproduceerde scooters die licht aangepast werden, maar in 1951 werden ze geheel in Duitsland gebouwd. 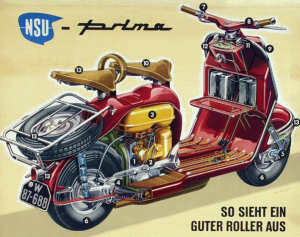 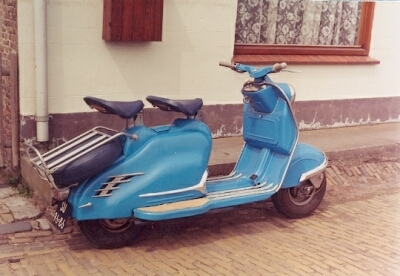 Deze scooter-productie eindigde in 1959. 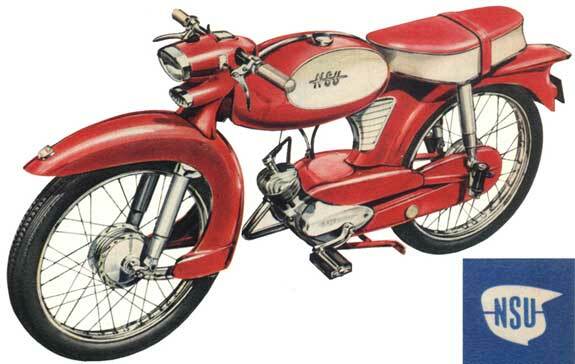 In de jaren vijftig vierde NSU triomfen op de racecircuits met de revolutionaire 125 cc en 250 cc racemotoren. 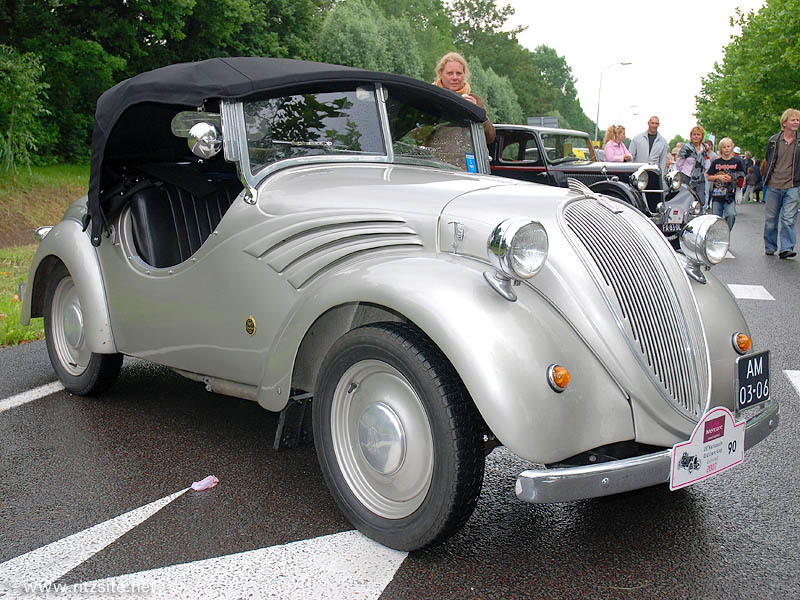 Het revolutionaire was gelegen in de nokkenasaandrijving door middel van twee excentrische drijfstangen. 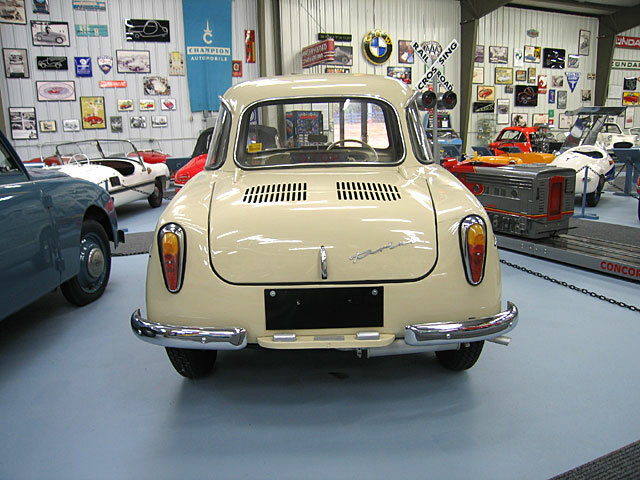 In 1957 deed NSU de motorfietsproductie gedeeltelijk over naar deJoegoslavische Pretis-fabriek om zich meer op de automarkt te kunnen concentreren. 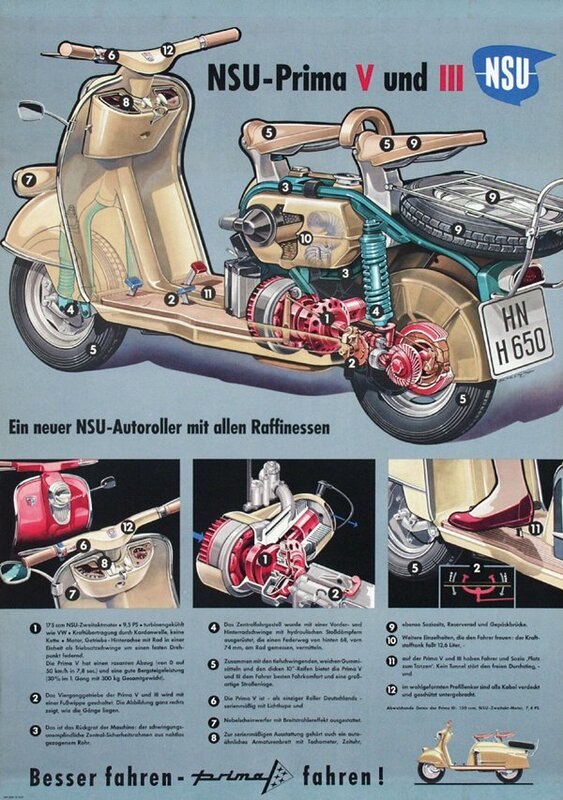 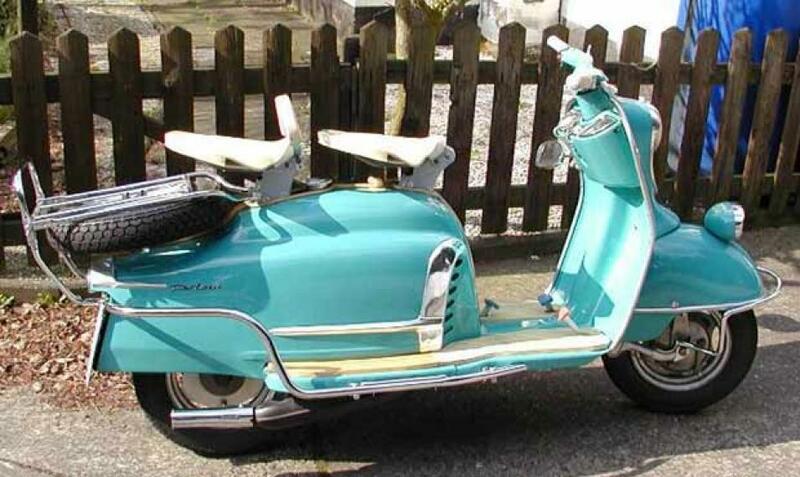 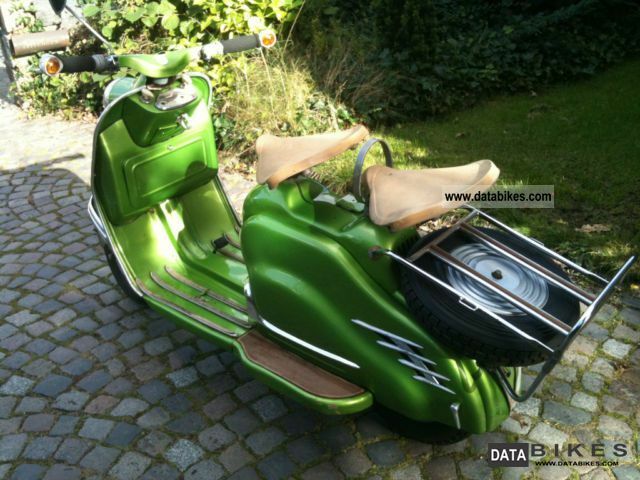 Wel werden er nog een tijdje Lambretta–scooters gebouwd, en daarna nog de NSU Prima-scooter. 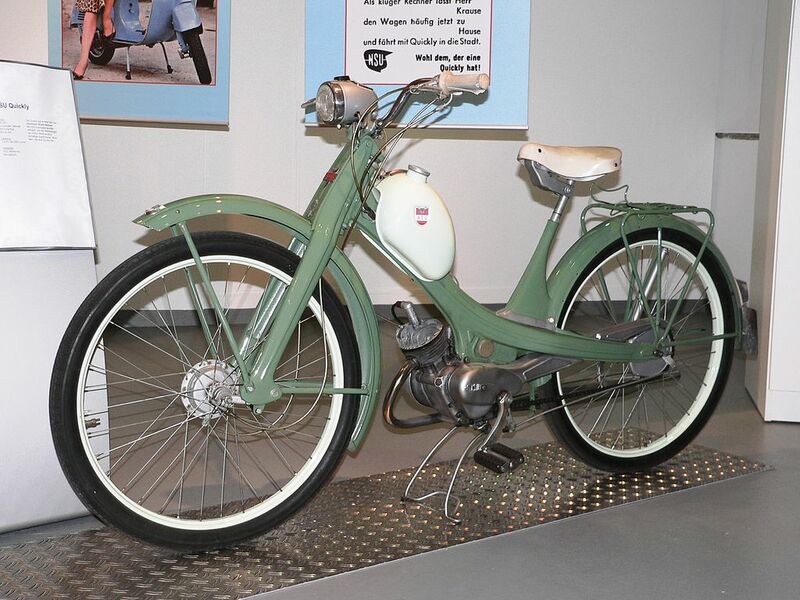 In 1965 werd de motorfietsenproductie beëindigd. 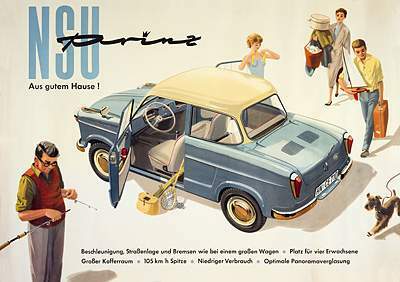 NSU gebruikte de slagzin Vorsprung durch Technik (“Voorsprong door Techniek”), die tegenwoordig doorAudi wordt gebezigd. 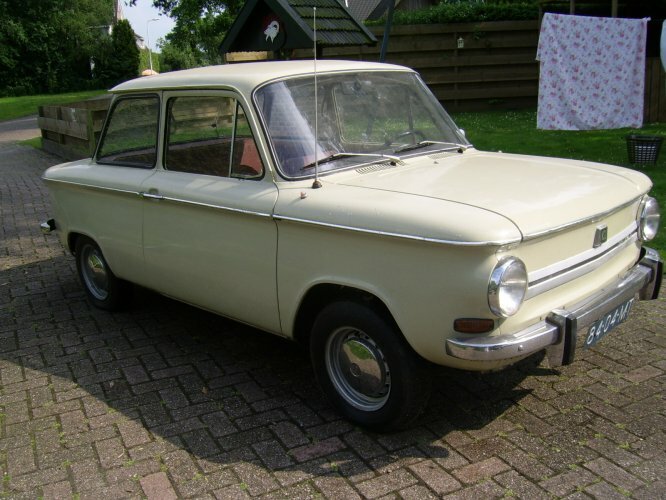 NSU (algemeen): Na Starten Uitgeput, Nooit Slechter Uitgevonden, Nooit Sneller Uitgevonden, NortonSpareparts Used (GB). 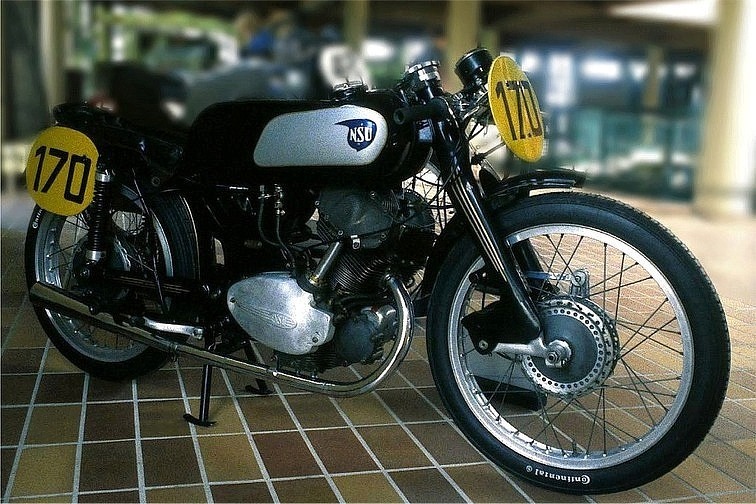 (De laatste spotnaam ontstond toen ontwerper Walter William Moore van Norton naar NSU ging). 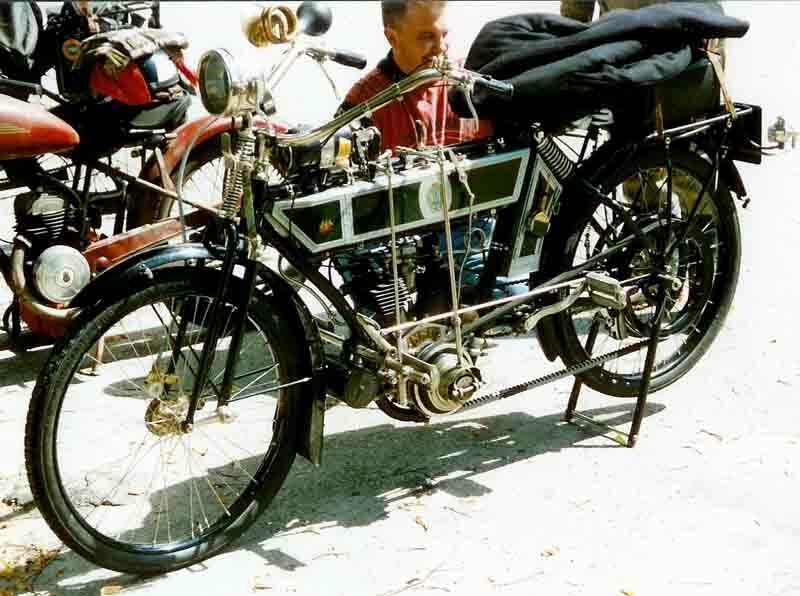 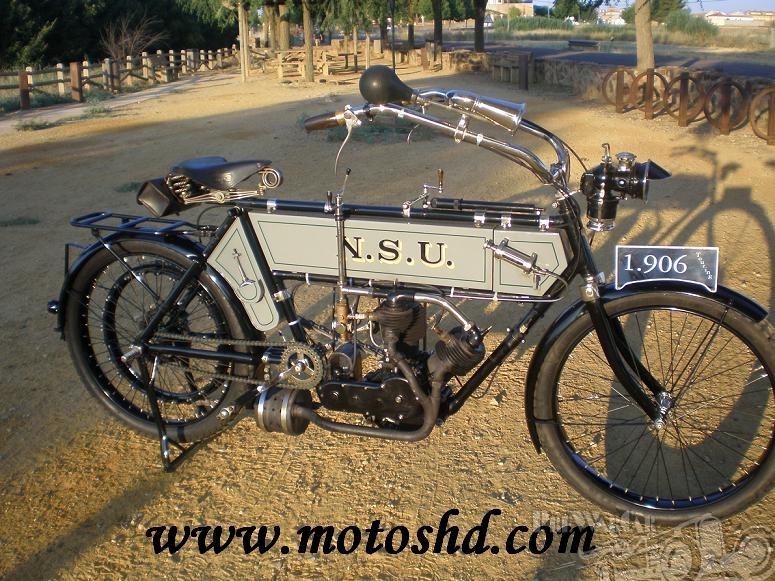 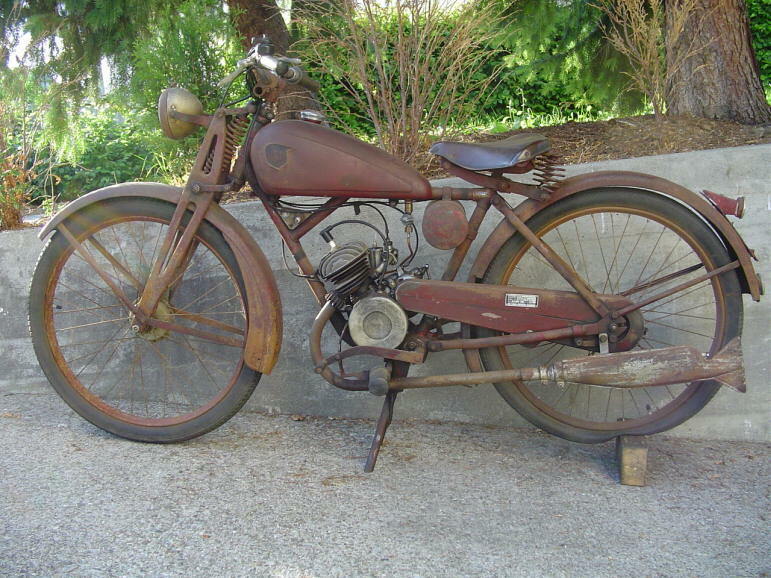 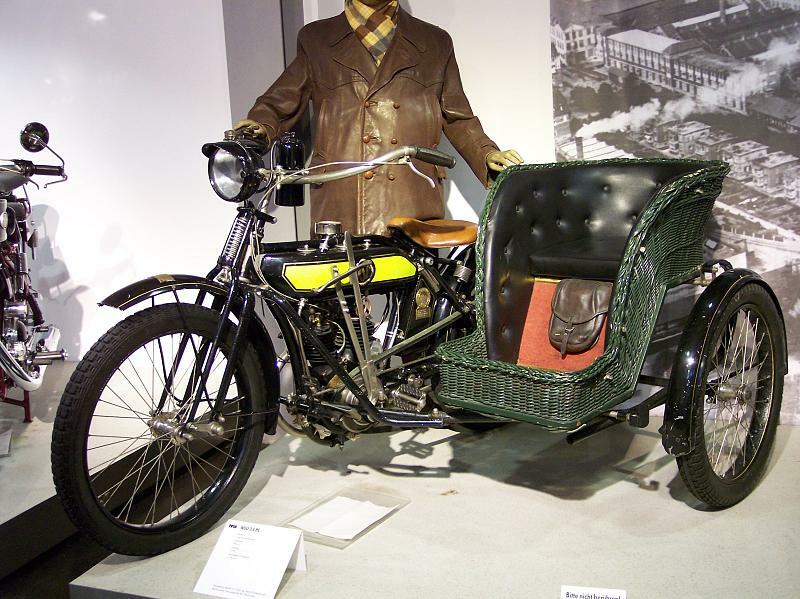 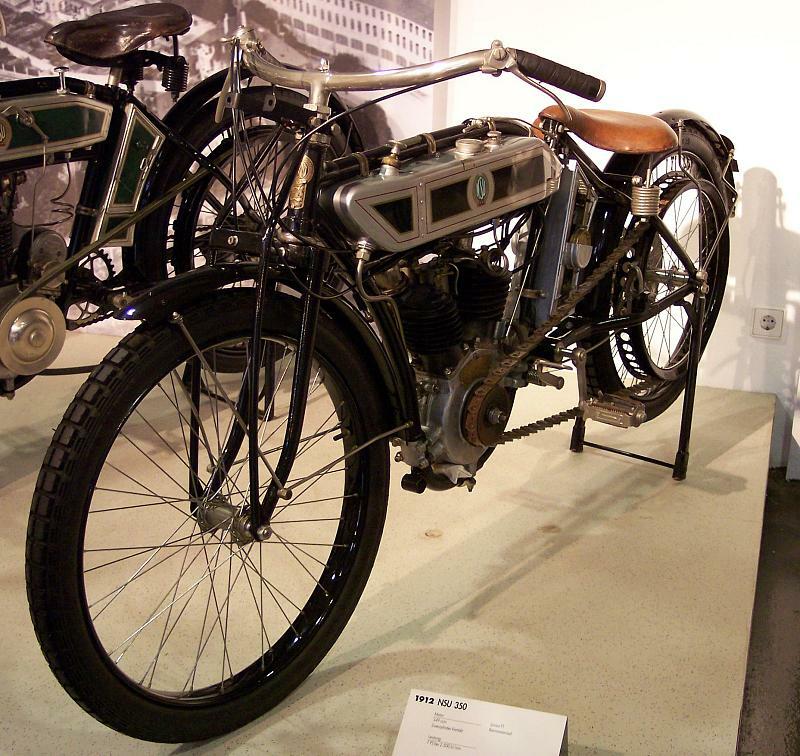 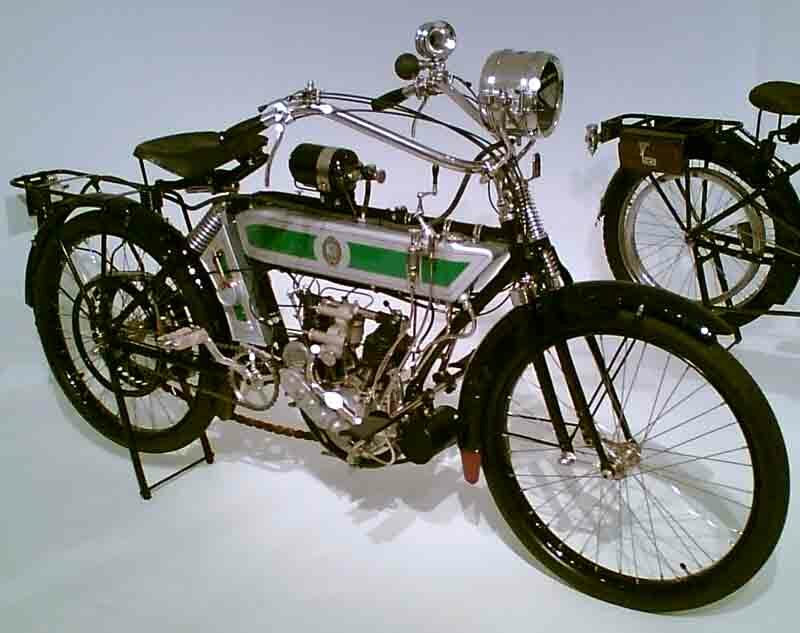 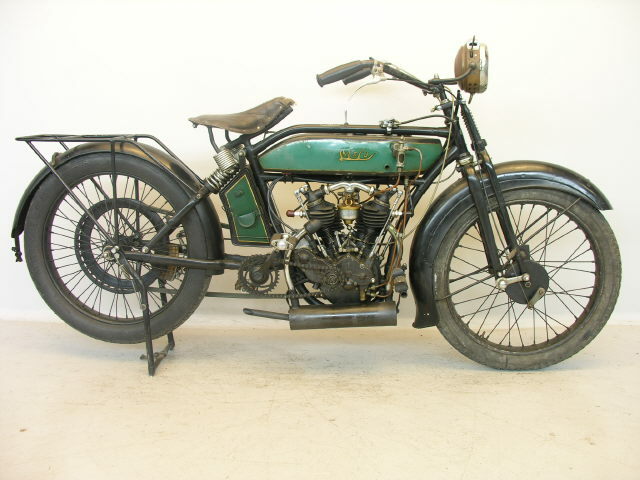 Do you know where I can obtain pictures for a 1903 NSU twin motorcycle. 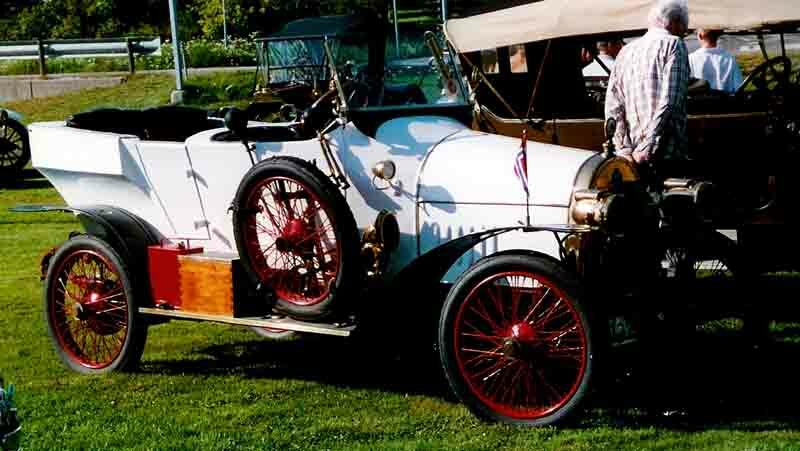 I have the motor and a few other items but before I can proceed to rebuild the unit some high quality pictures of the motor would be of considerable help.